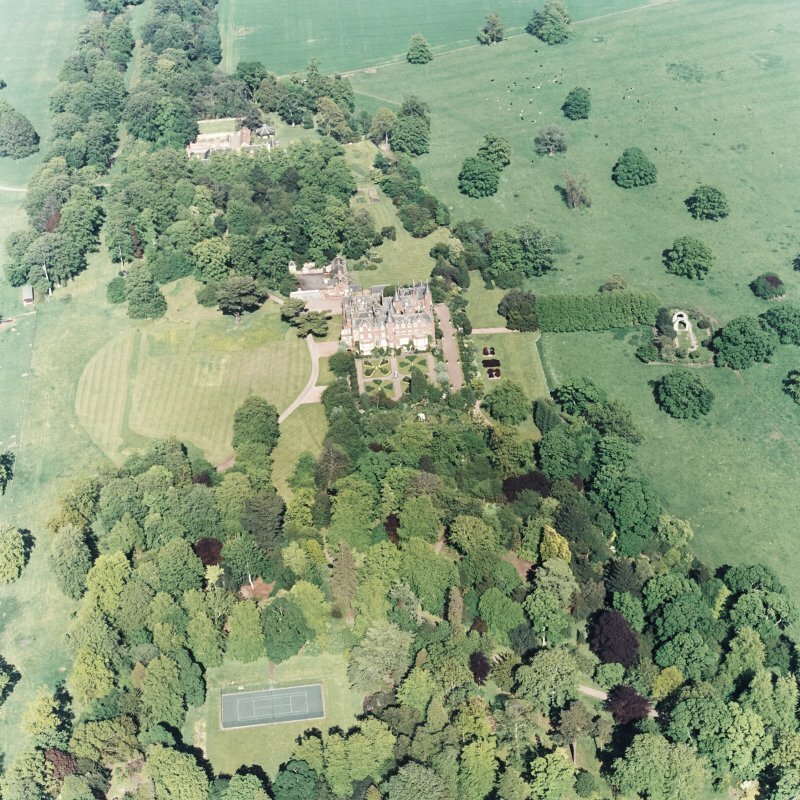 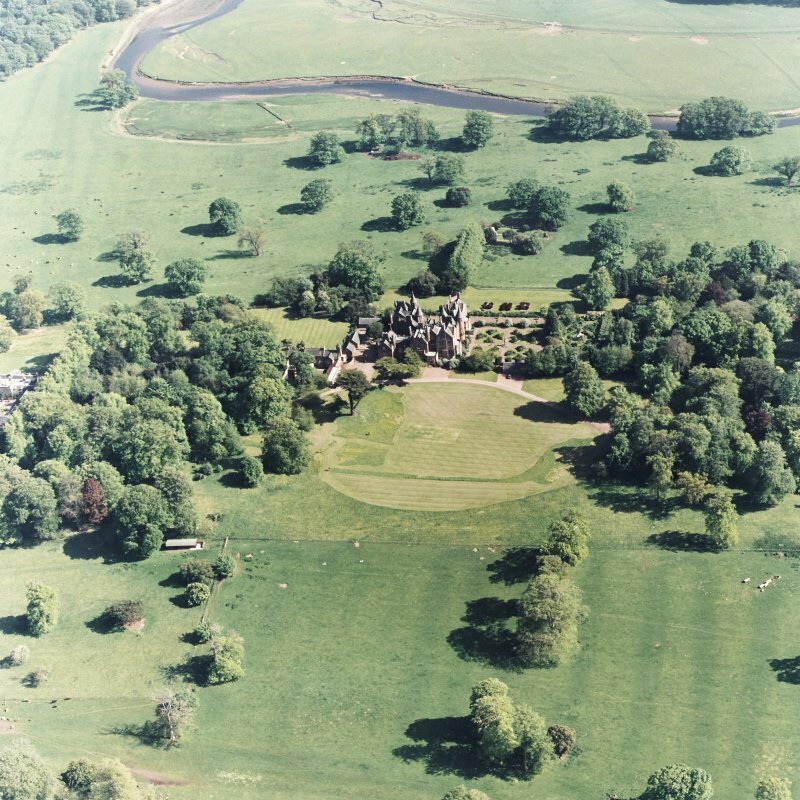 Aerial view of Tyninghame House, the site of Tyninghame manse, St Baldred's church, the sundial and gardens and the clock tower court, taken from the SE. 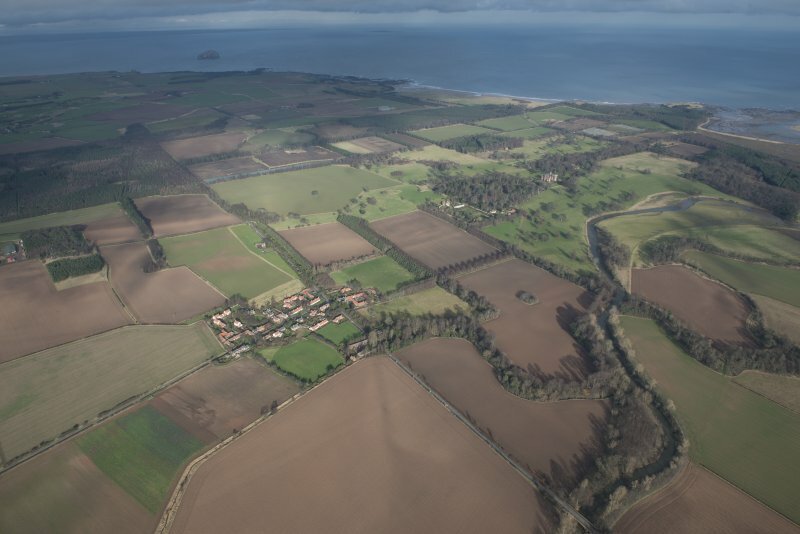 General oblique aerial view of Tyninghame, looking N.
General oblique aerial view looking across Tyninghame House with the Bass Rock in the distance, taken from the SSE. 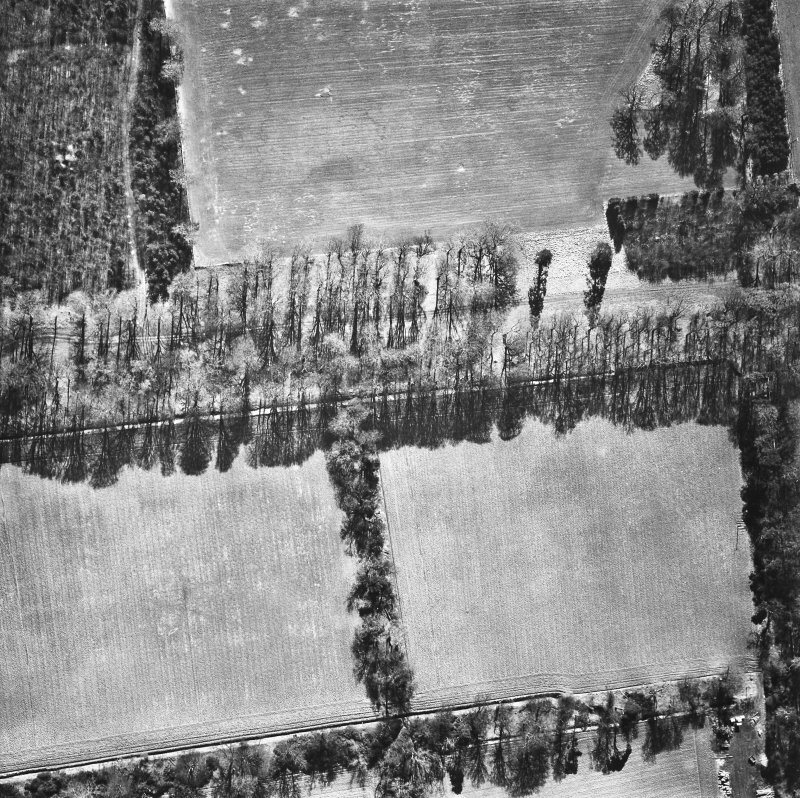 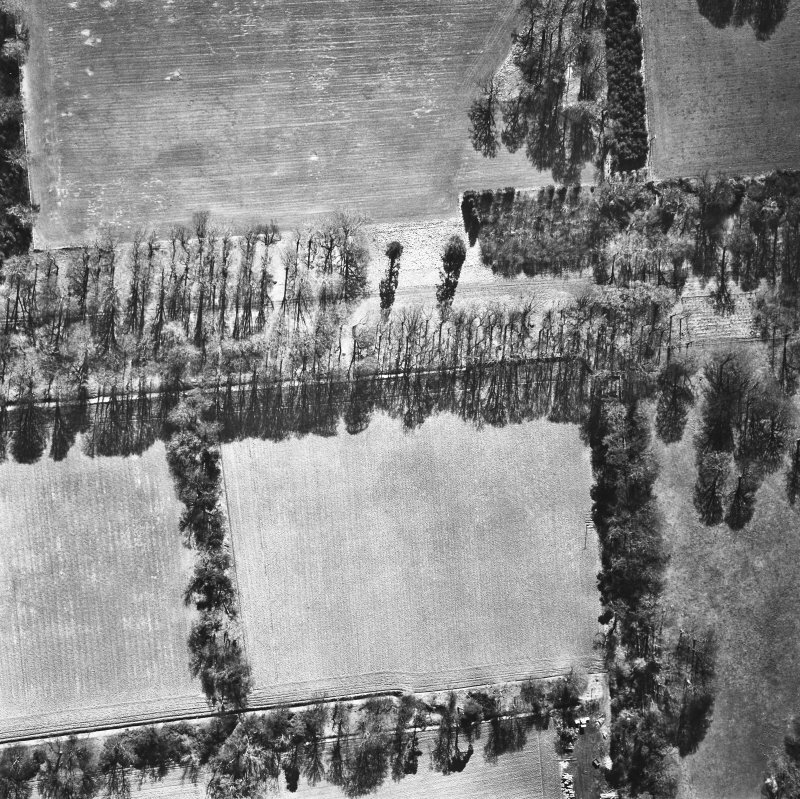 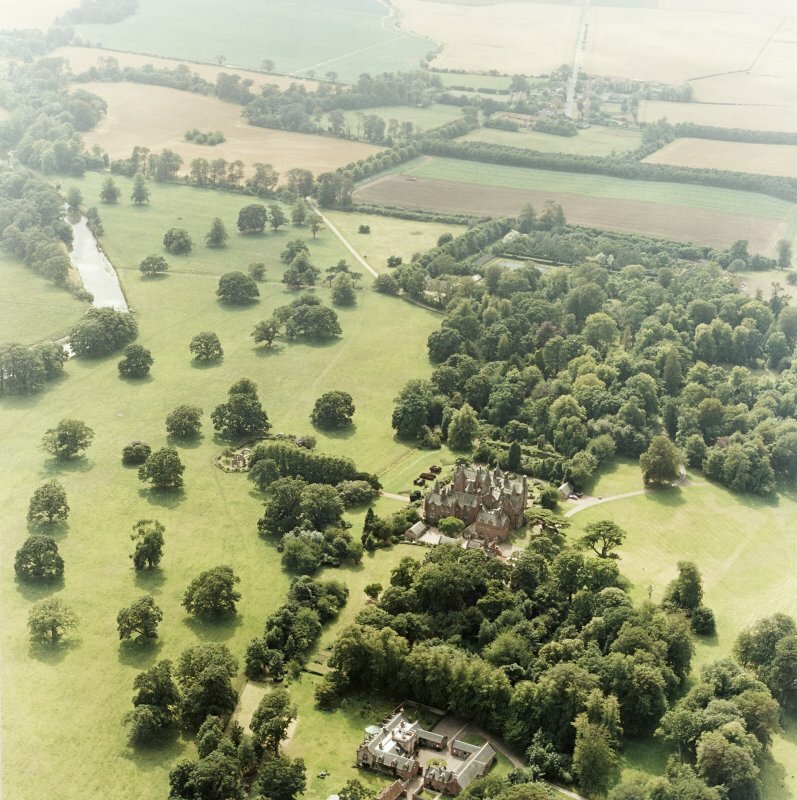 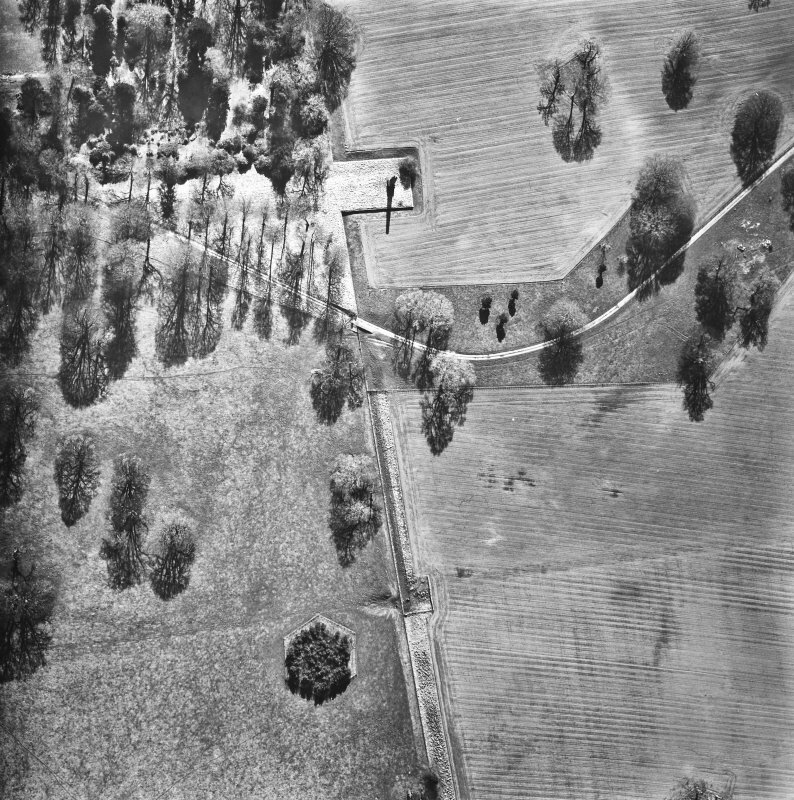 Oblique aerial view of the country house and policies, taken from the SSW. 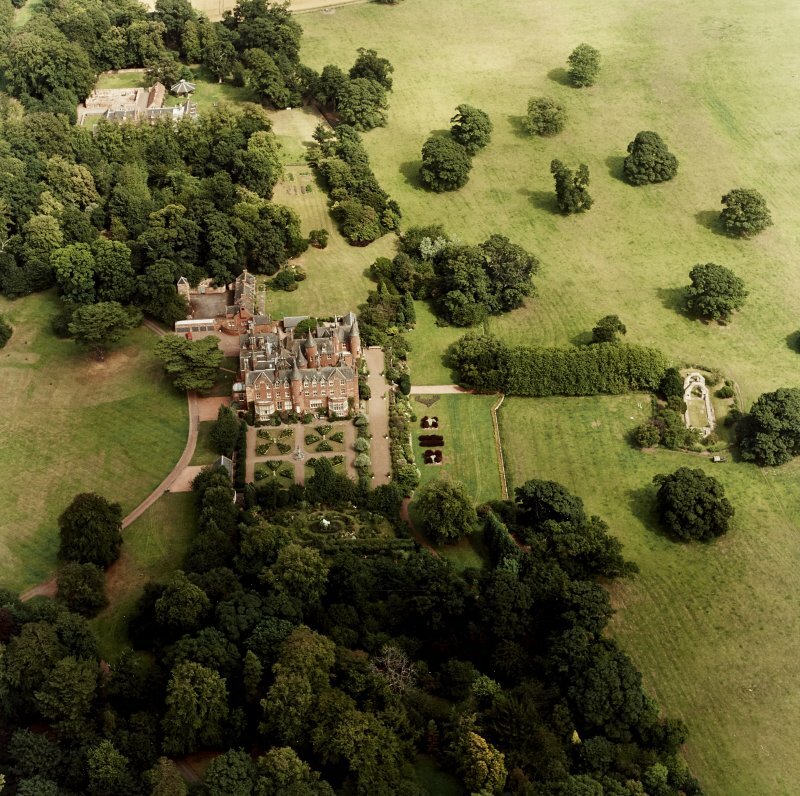 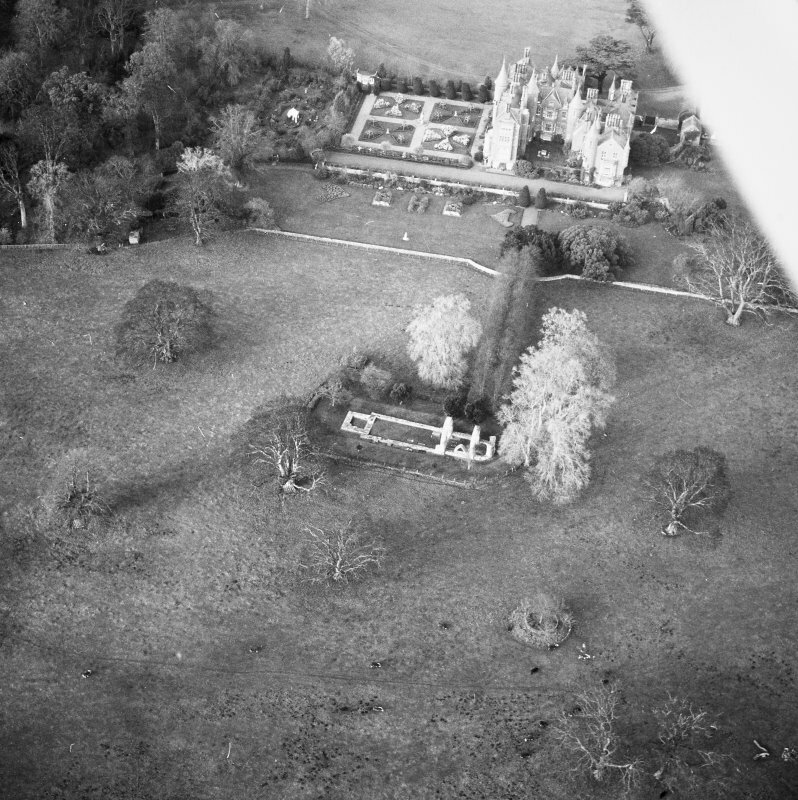 Aerial view of Tyninghame House, the site of Tyninghame manse, St Baldred's church, the sundial and gardens, and the clock tower court, taken from the N.
Aerial view of Tyninghame House, the site of Tyninghame manse, St Baldred's church, the clock tower court and the obelisk, taken from ENE. 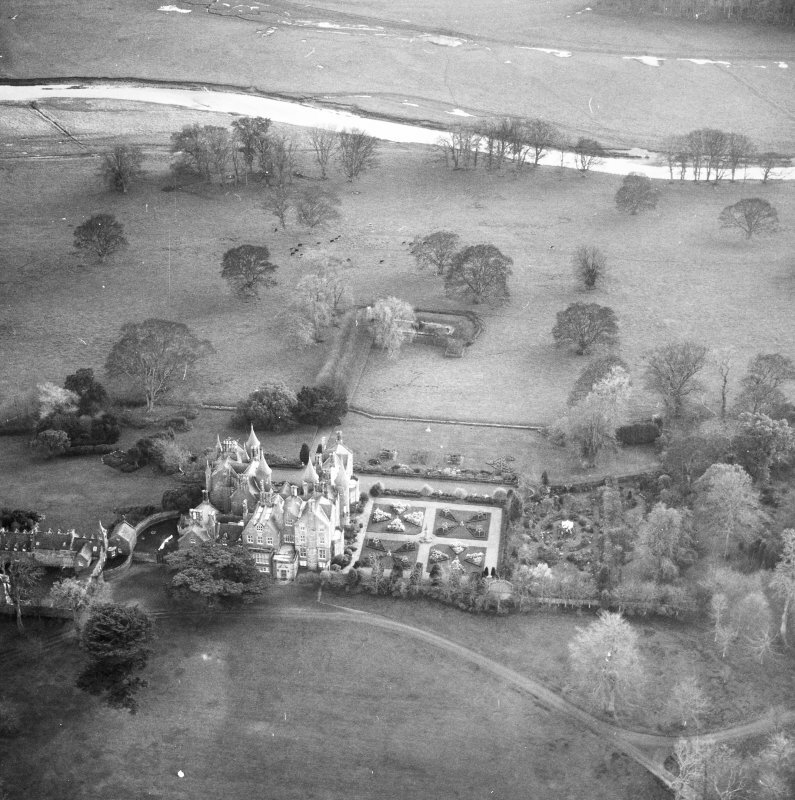 Aerial view of Tyninghame House, the site of Tyninghame manse, St Baldred's Church, the sundial and gardens and the clock tower court, taken from the S.
Historic photograph showing view from SW.
Aerial view of Tyninghame House, the site of Tyninghame manse, St Baldred's Church, the sundial and gardens, and the clock tower court, taken from the SSE. 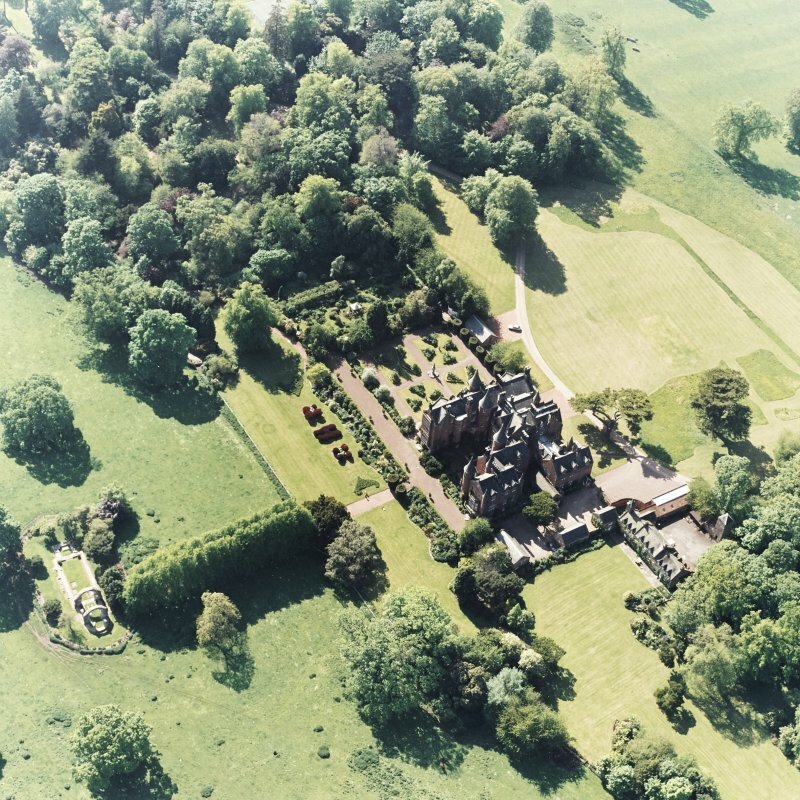 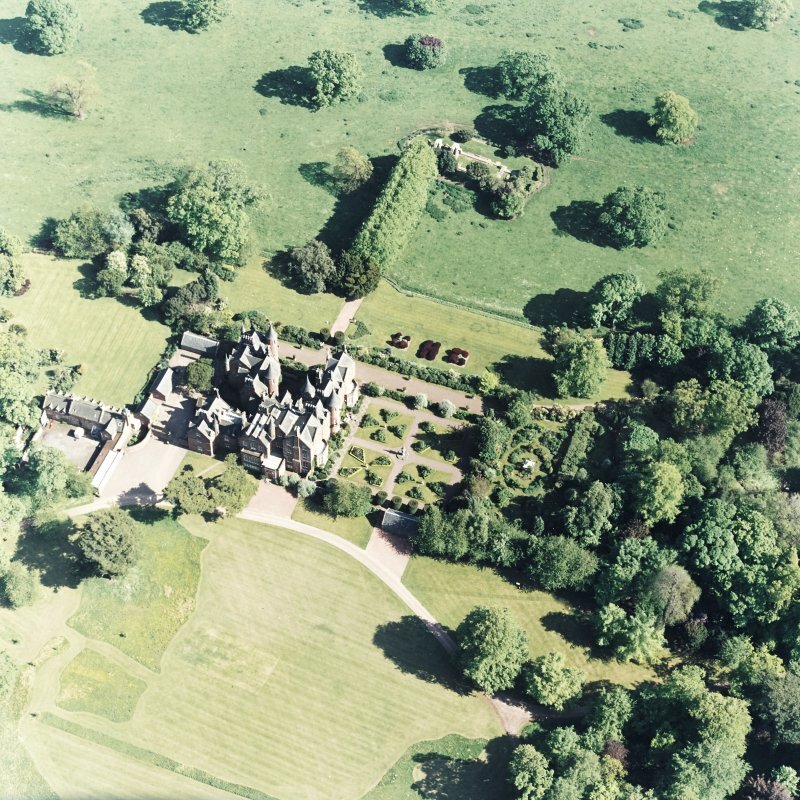 Aerial view of Tyninghame House, the site of Tyninghame manse, St Baldred's church, the sundial and gardens and the clock tower court, taken from the N.
Aerial view of Tyninghame House, the site of Tyninghame manse, St Baldred's church, the sundial and gardens and the clock tower court, taken from the NE. 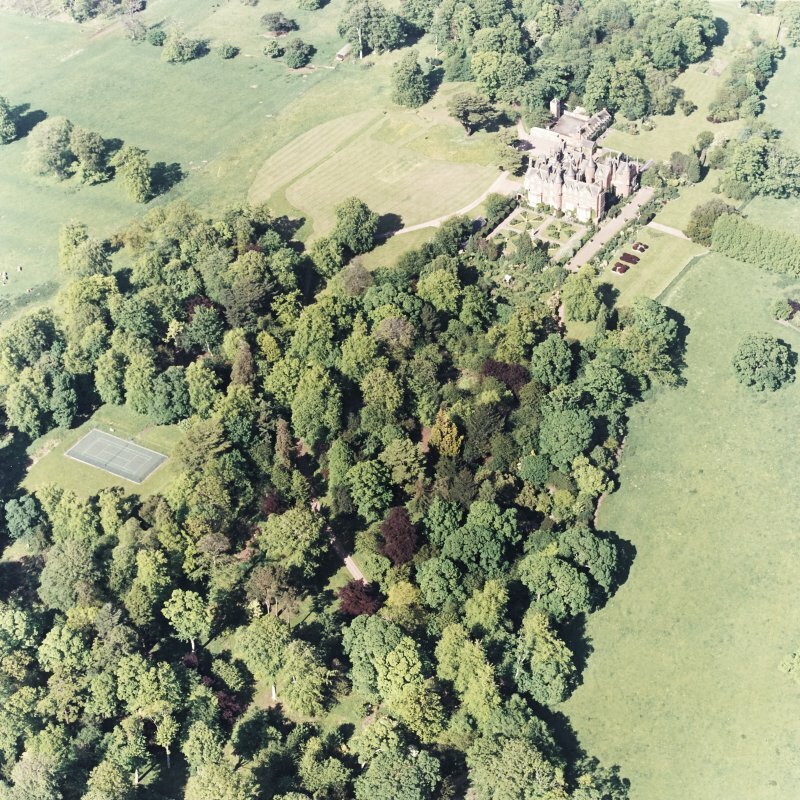 Aerial view of Tyninghame House, the site of Tyninghame manse, the sundial and gardens, and the clock tower court, taken from the SW.
Aerial view of Tyninghame House, the site of Tyninghame manse, St Baldred's church, the sundial and gardens and the clock tower court, taken from WSW. 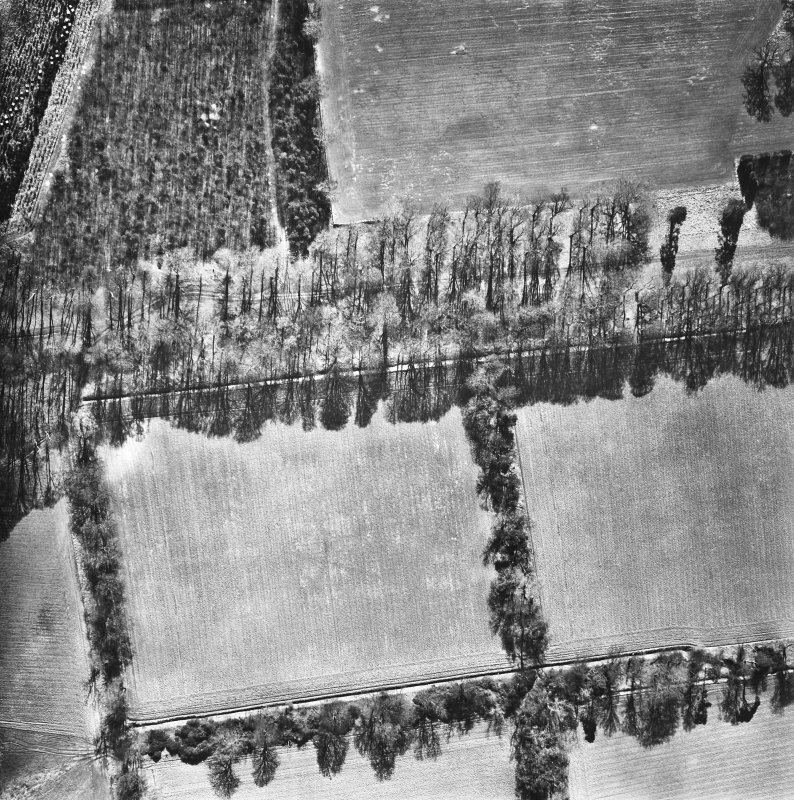 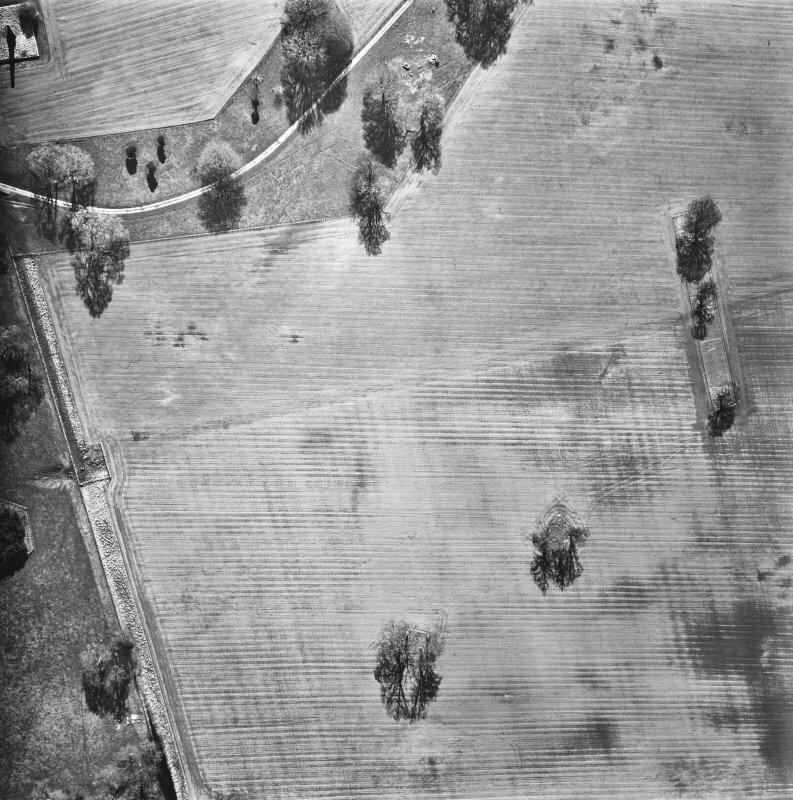 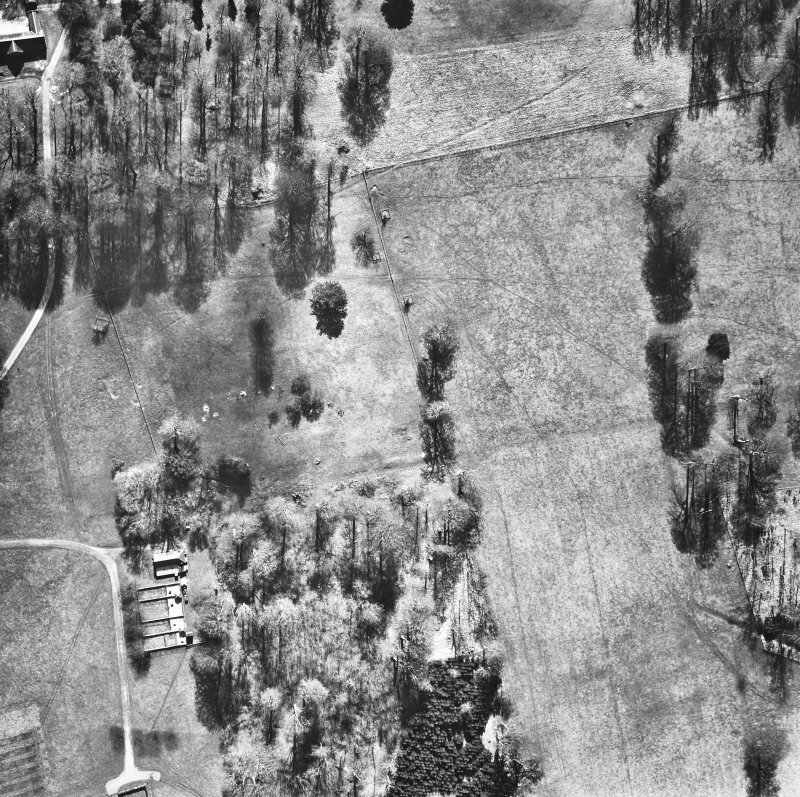 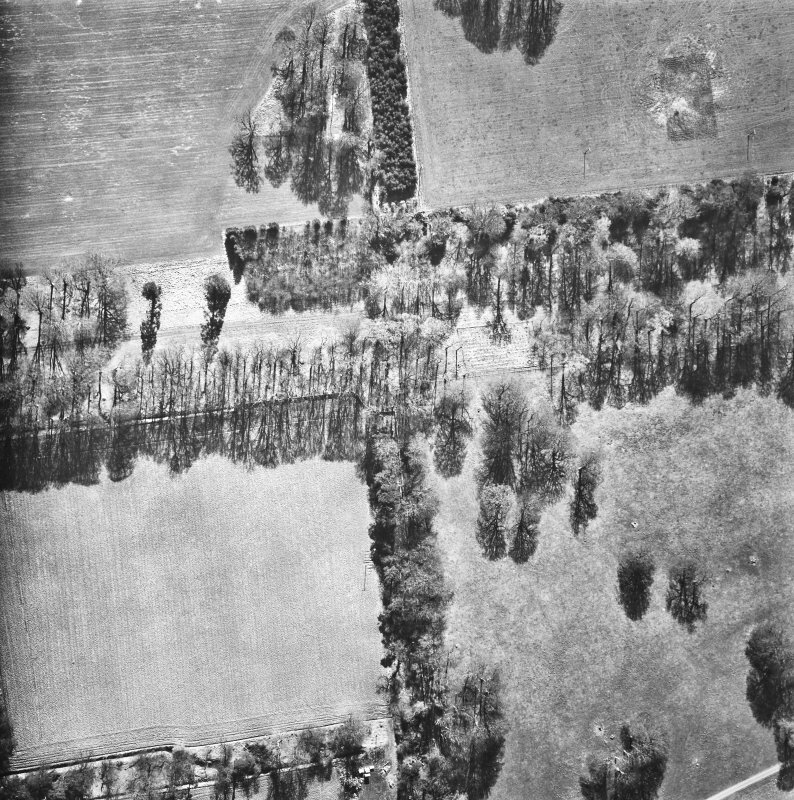 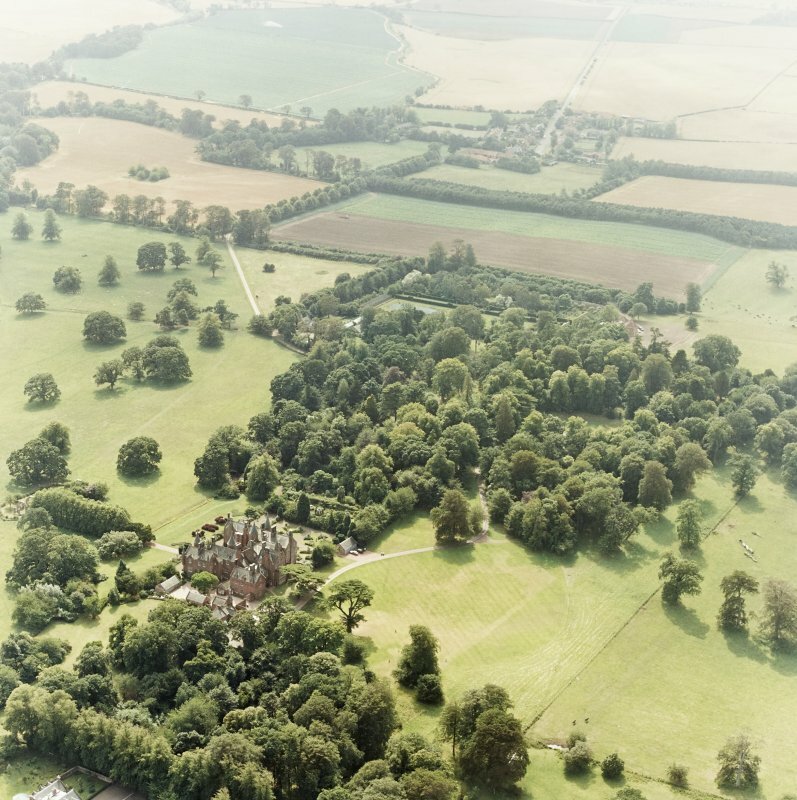 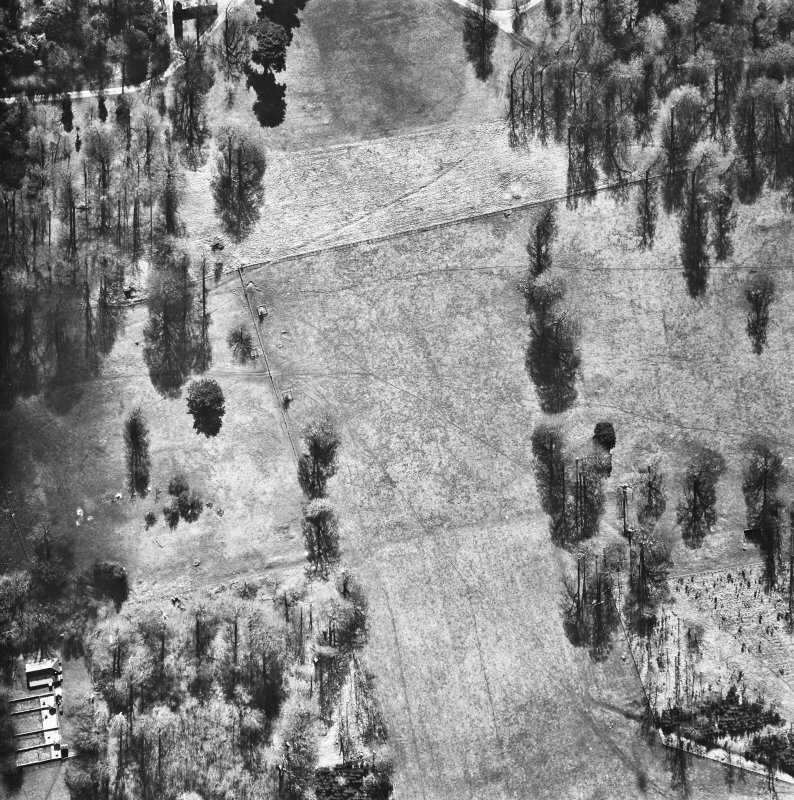 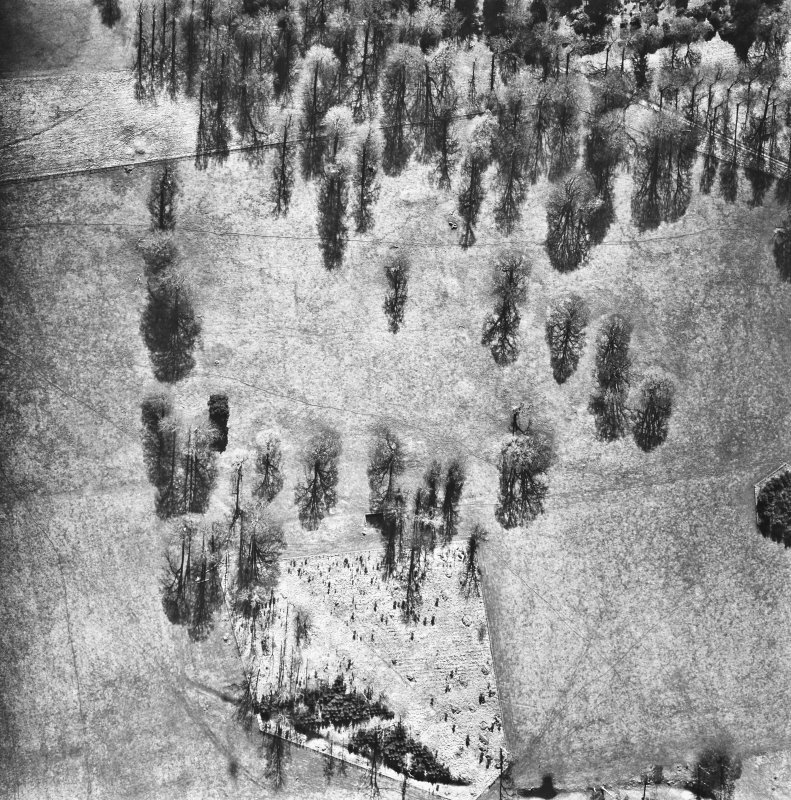 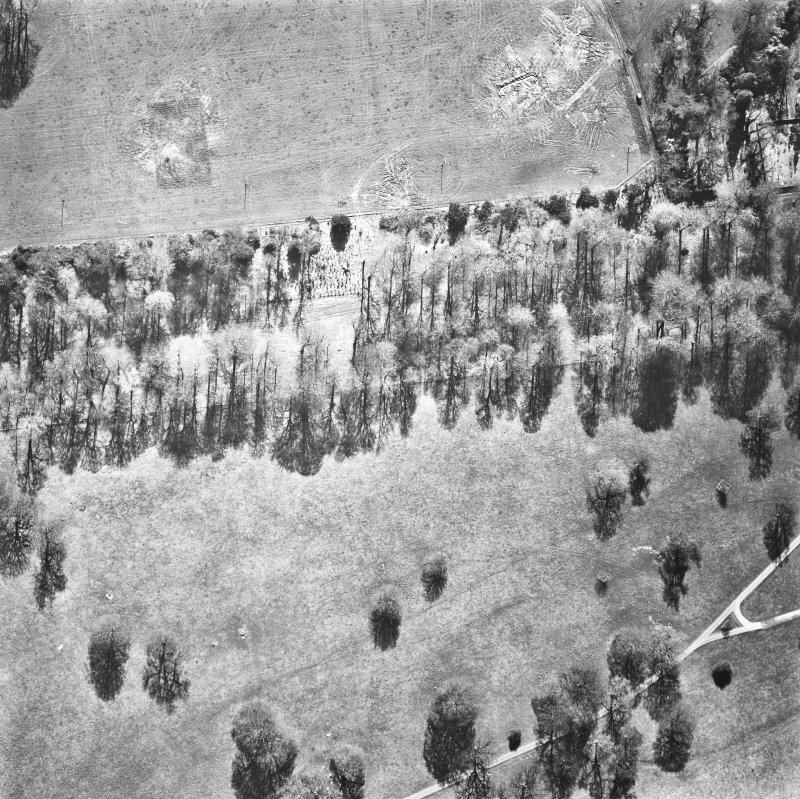 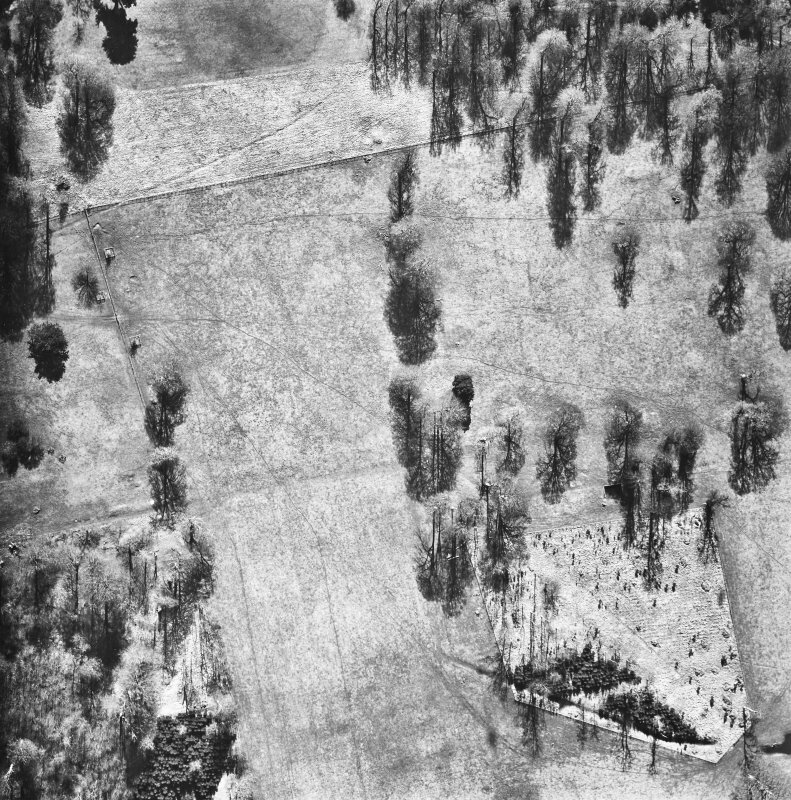 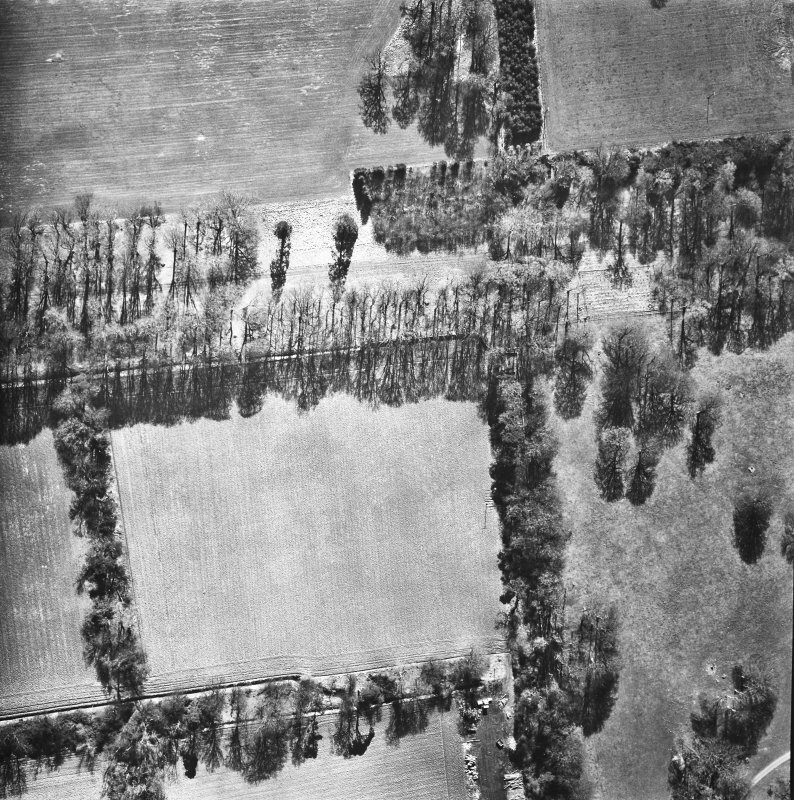 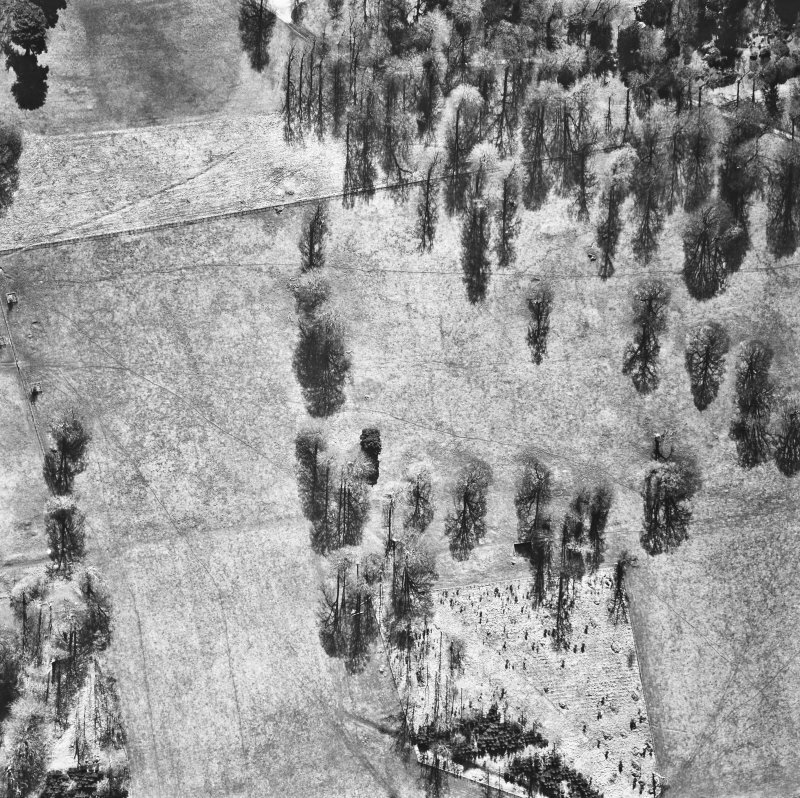 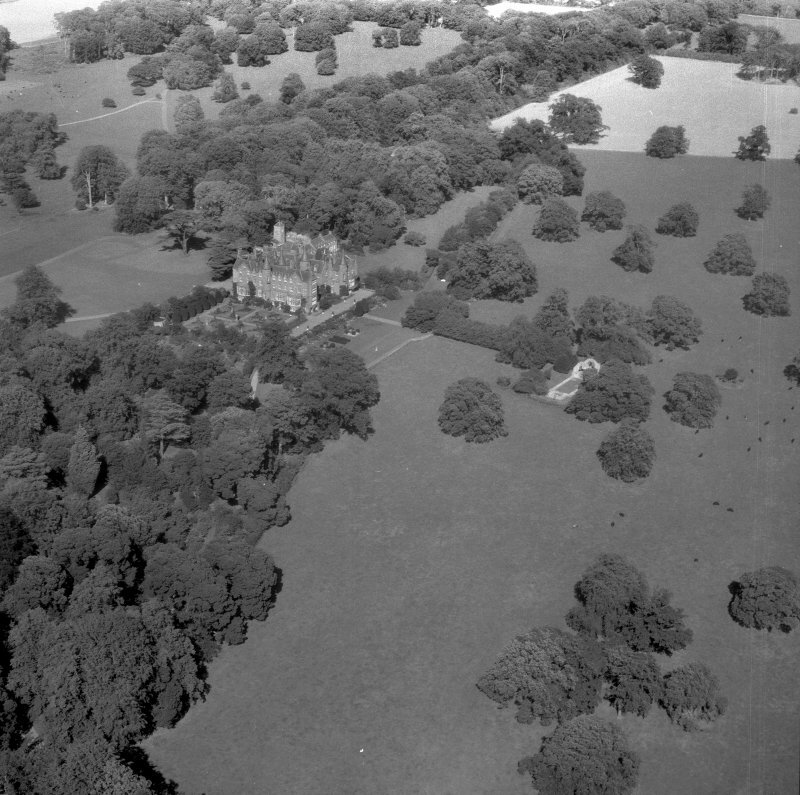 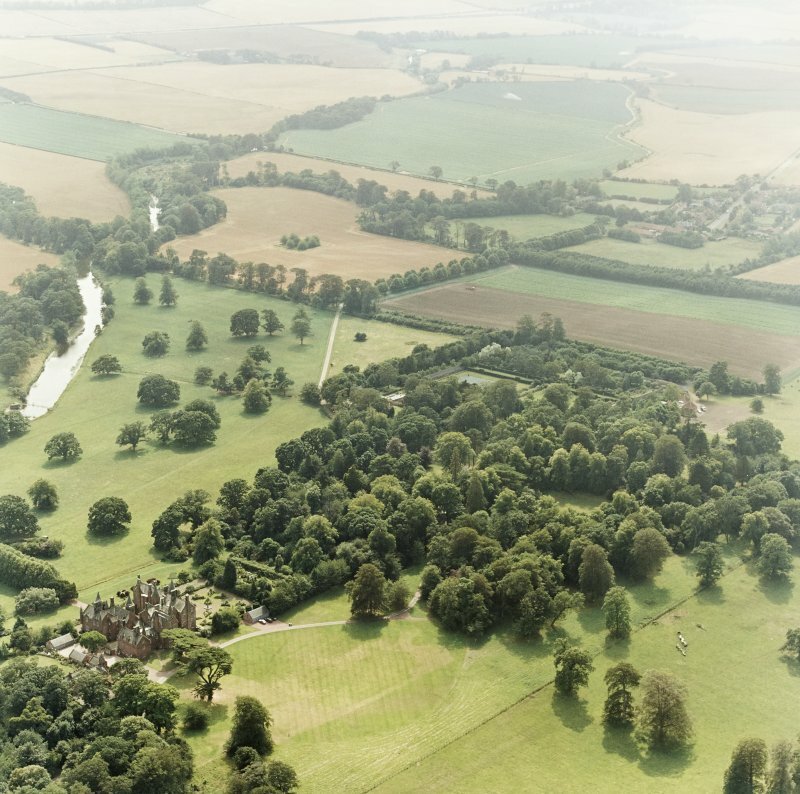 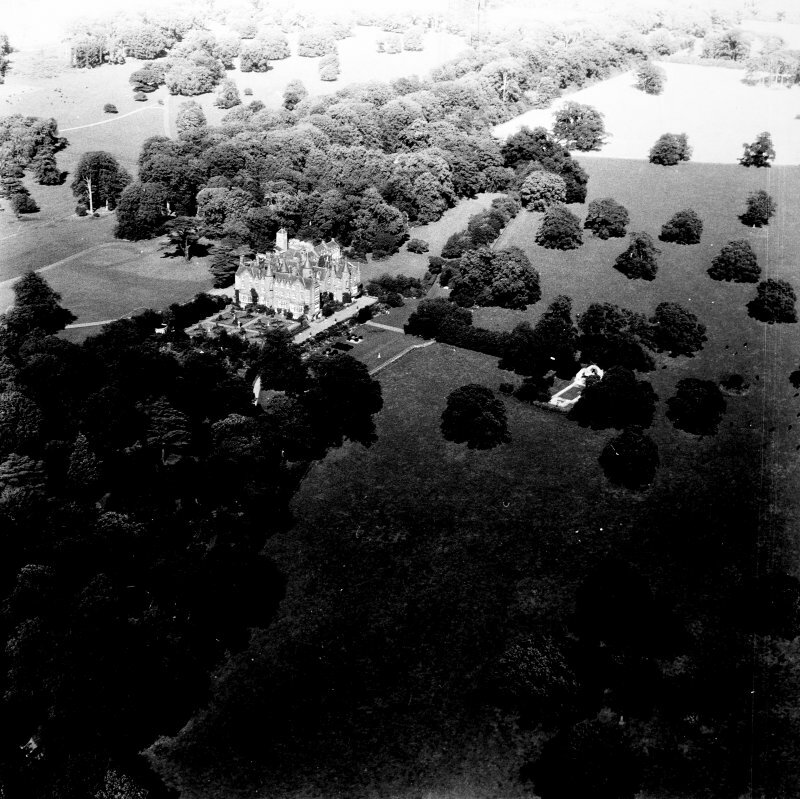 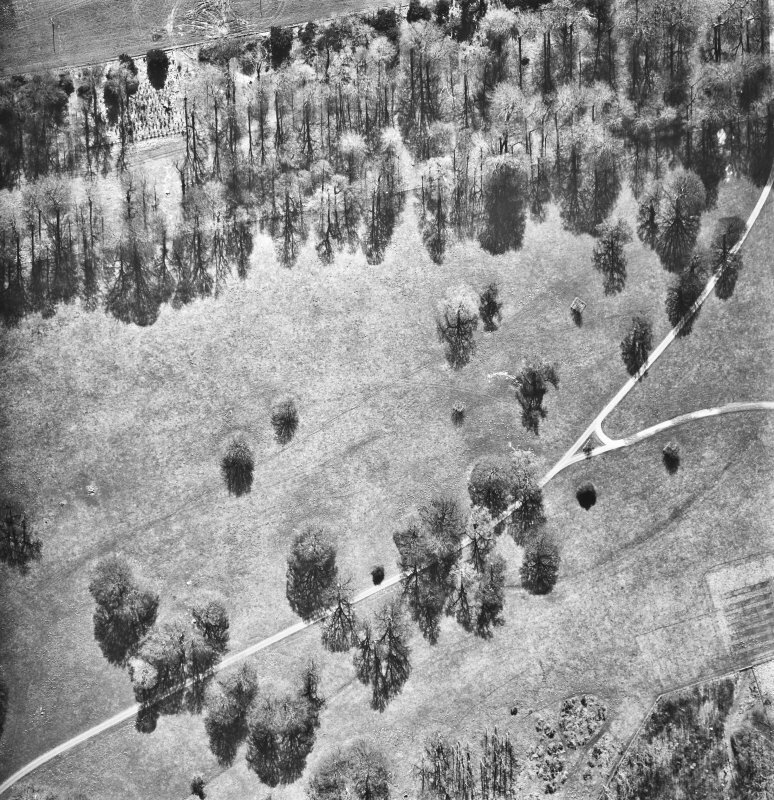 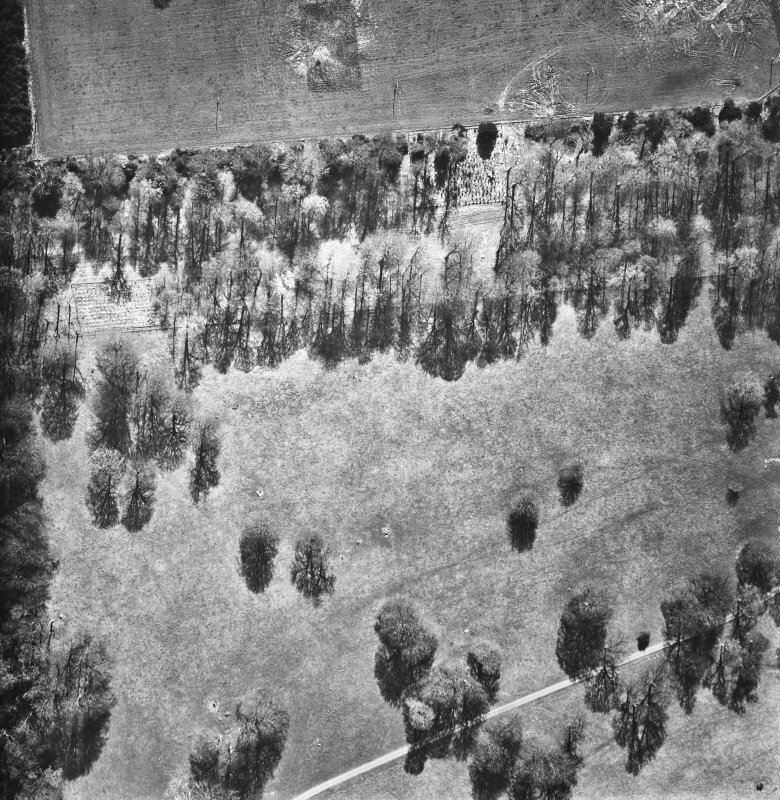 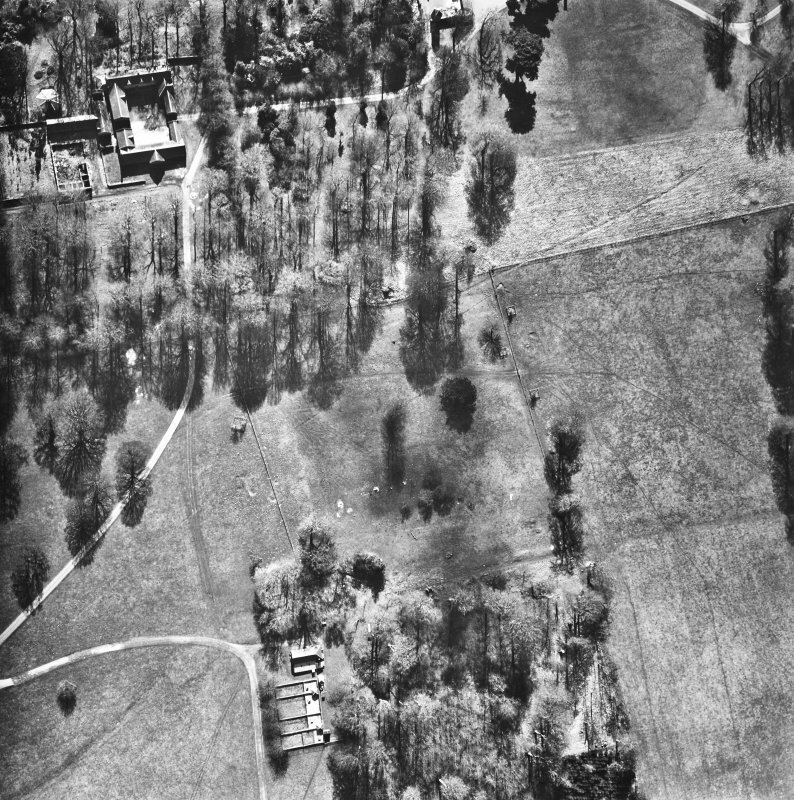 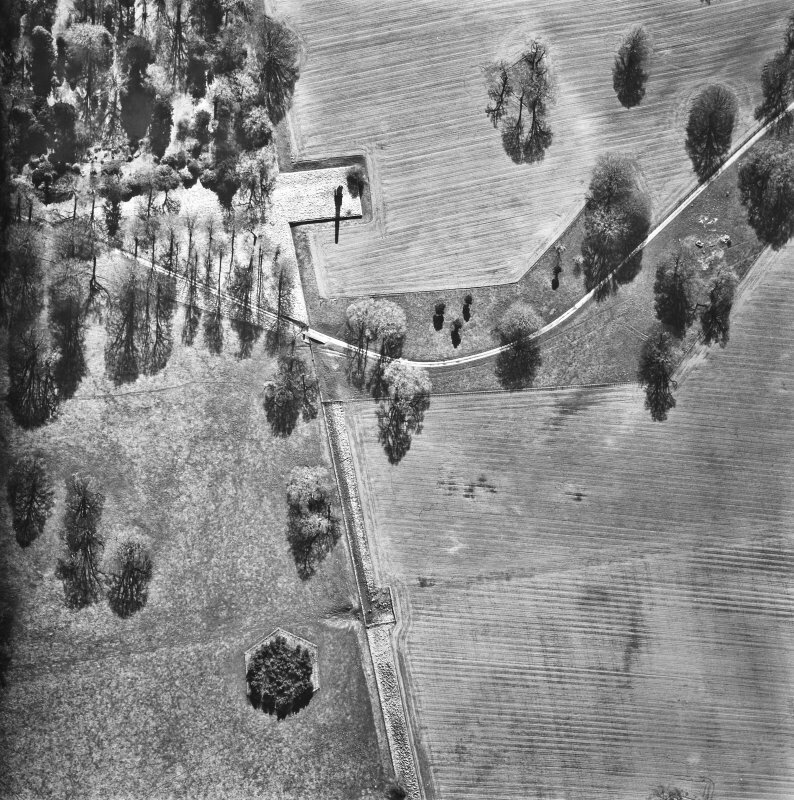 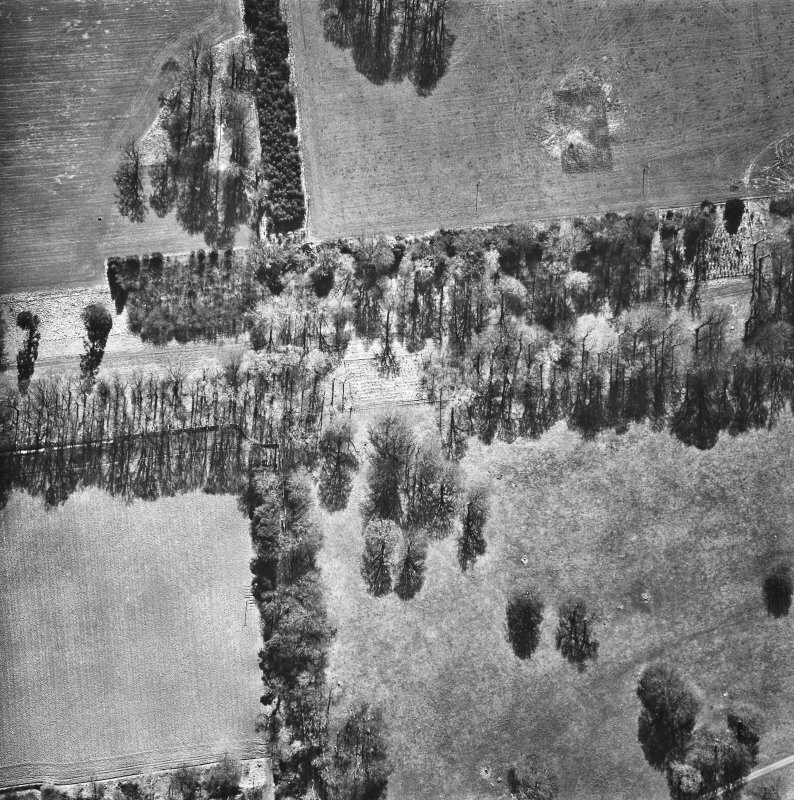 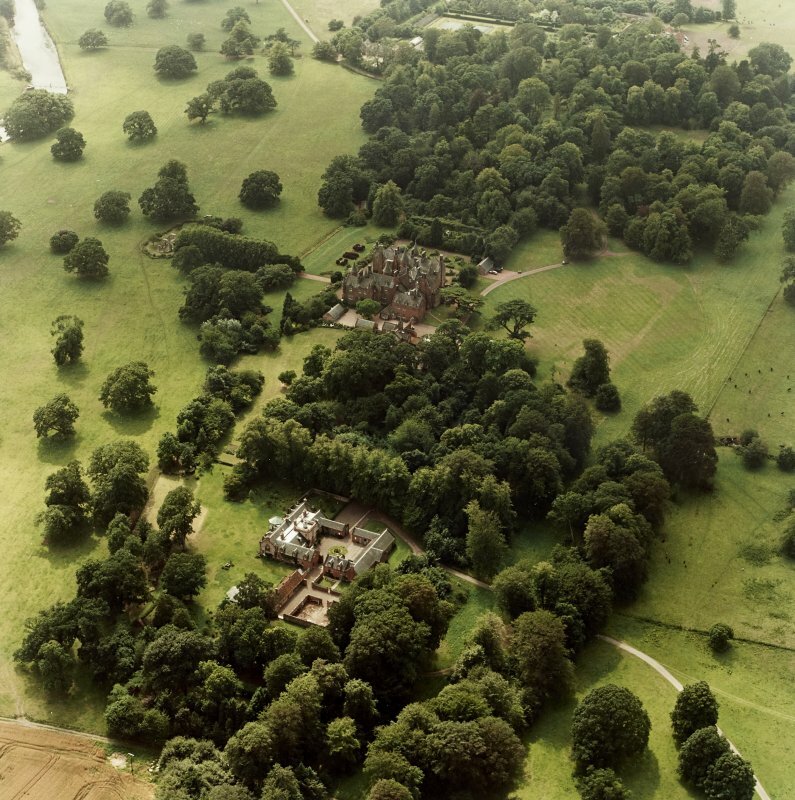 General oblique aerial view of the country house and policies, taken from the WSW. 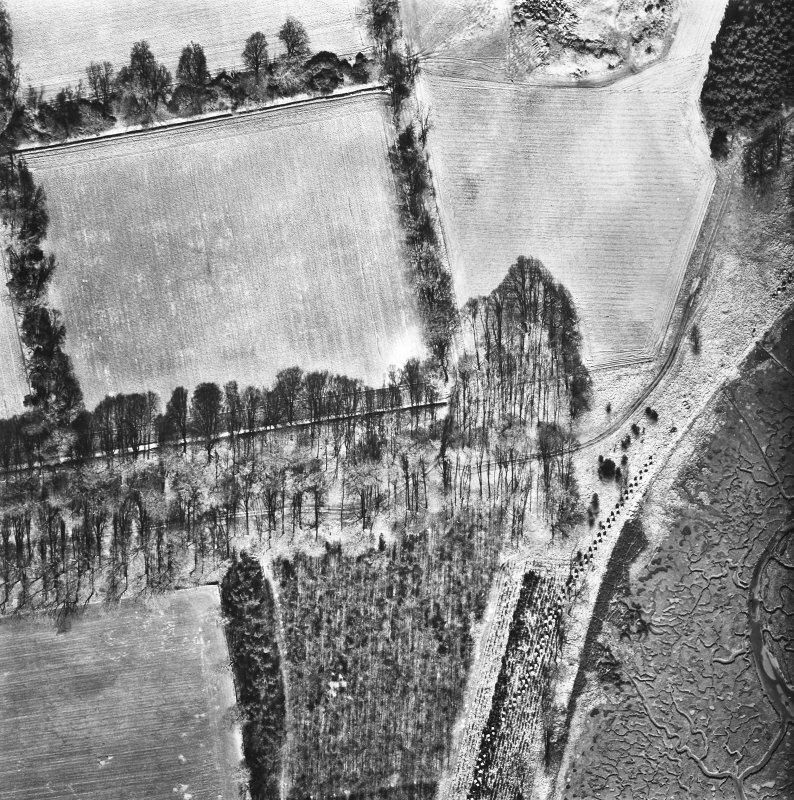 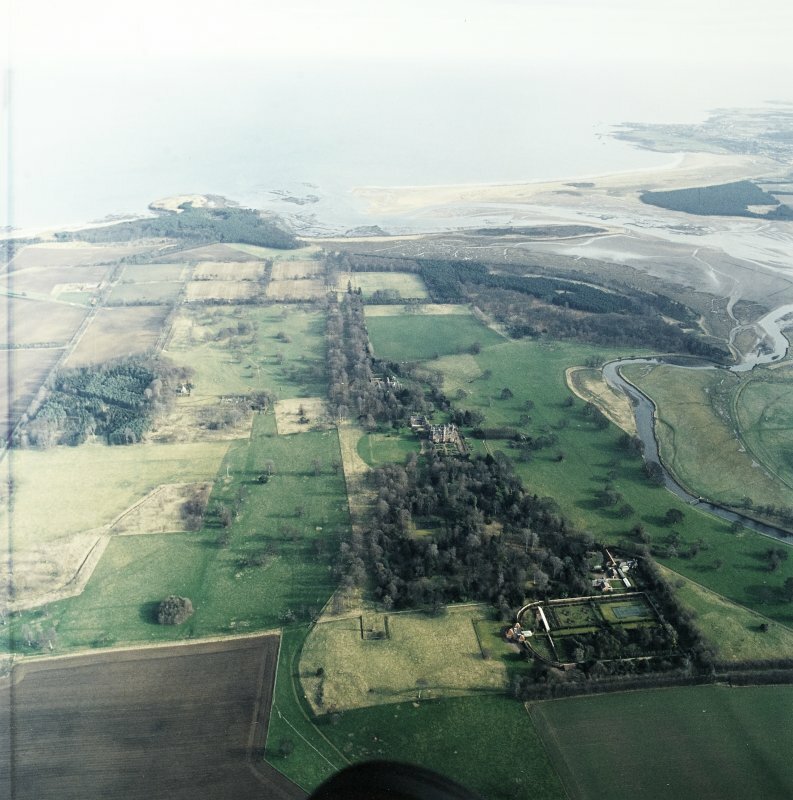 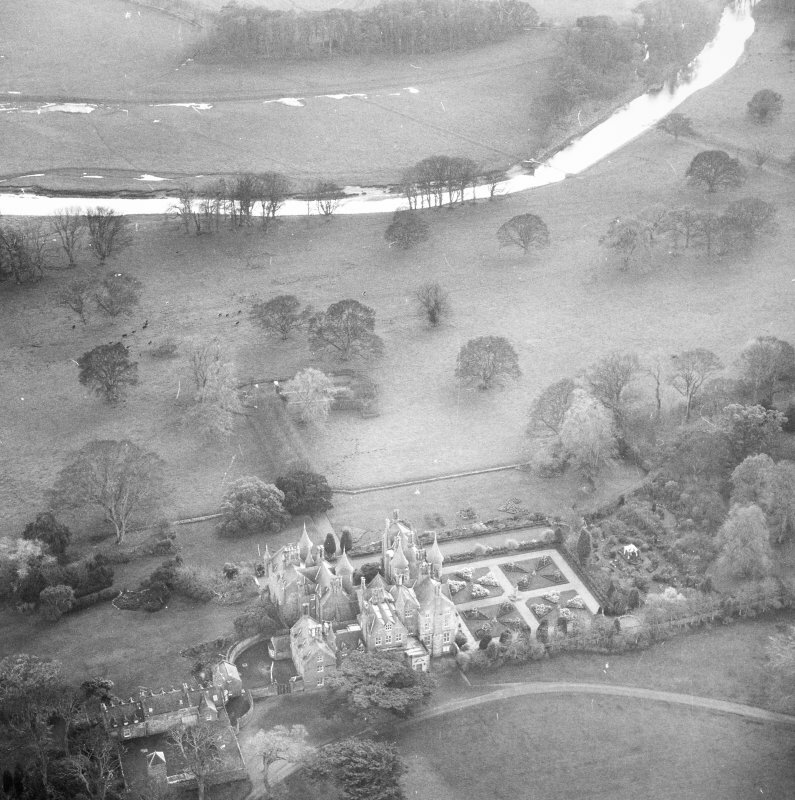 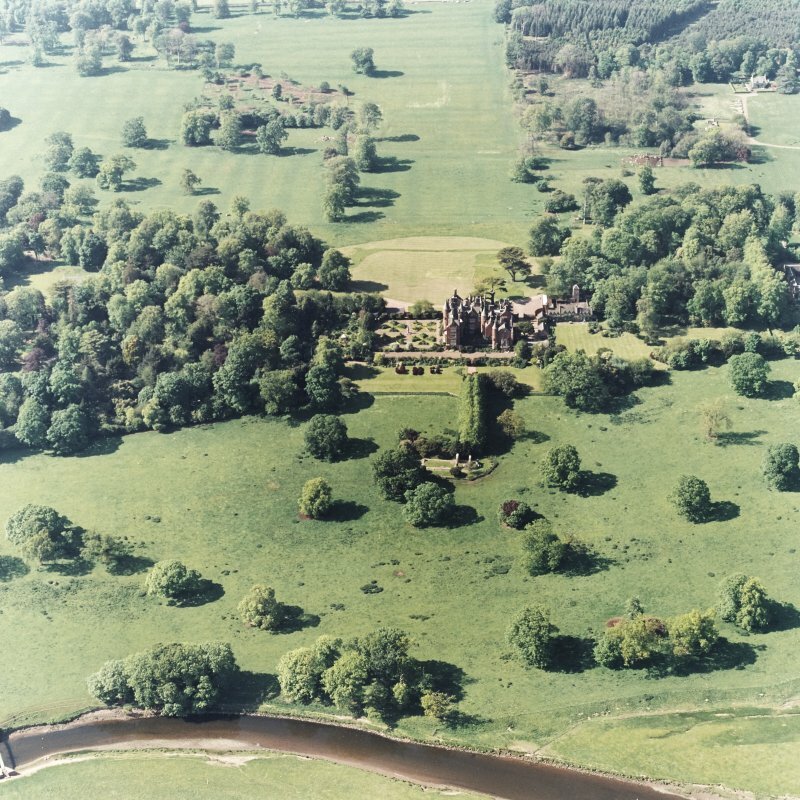 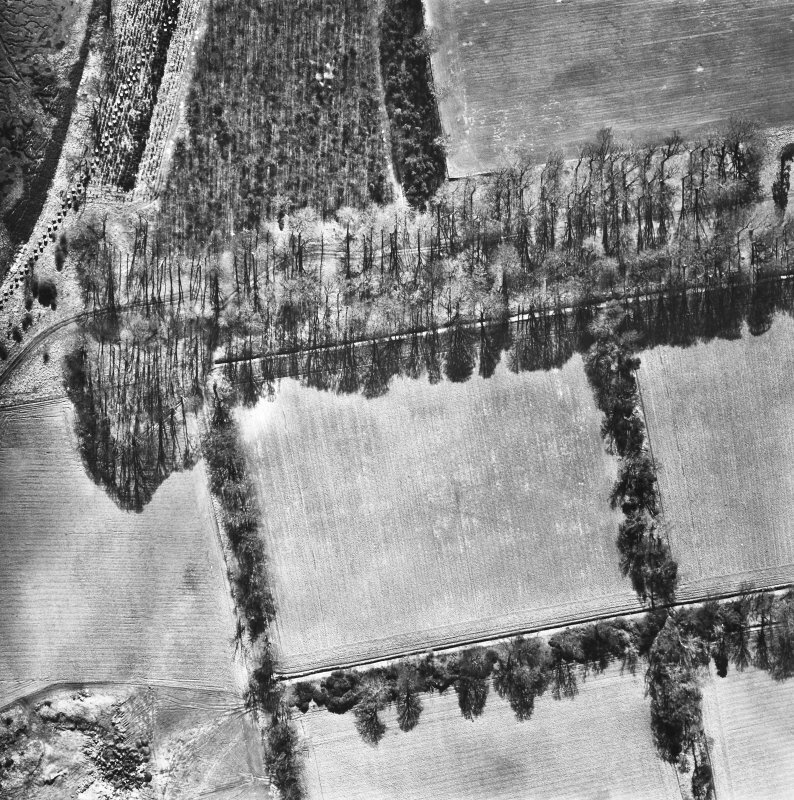 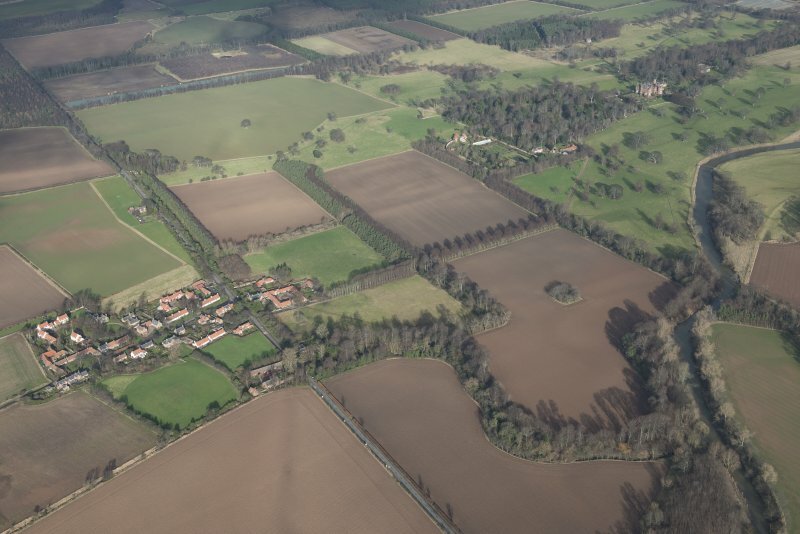 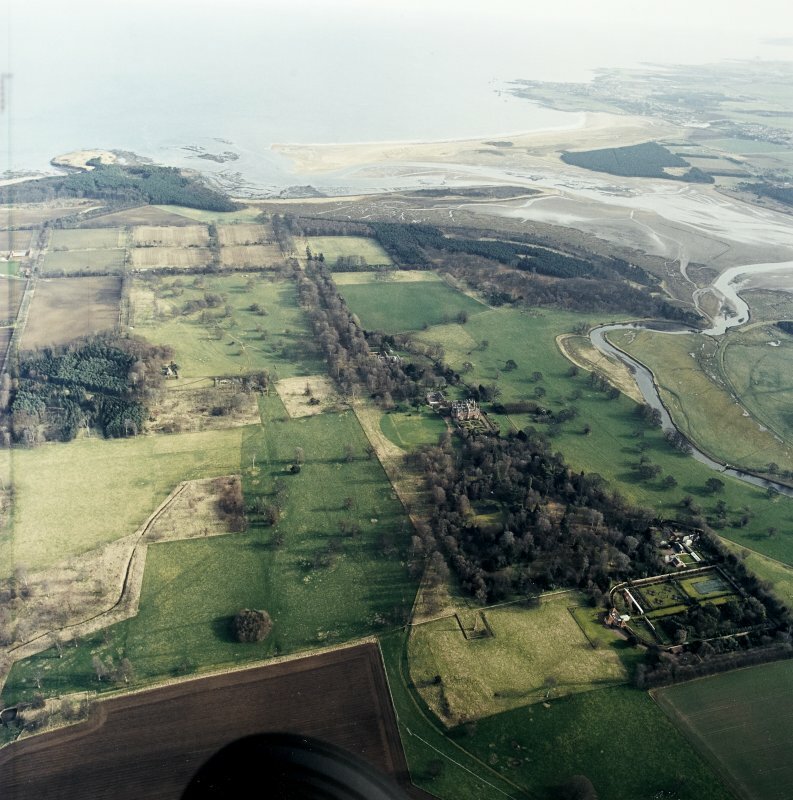 Aerial view of Tyninghame House, the site of Tyninghame manse, St Baldred's church and the stables and dairy, taken from the NE. 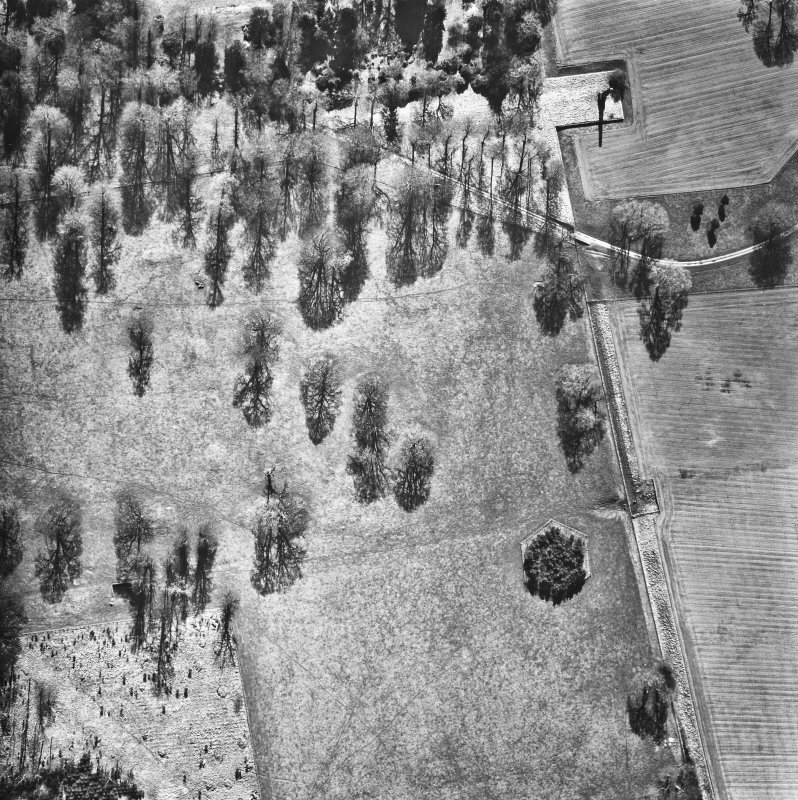 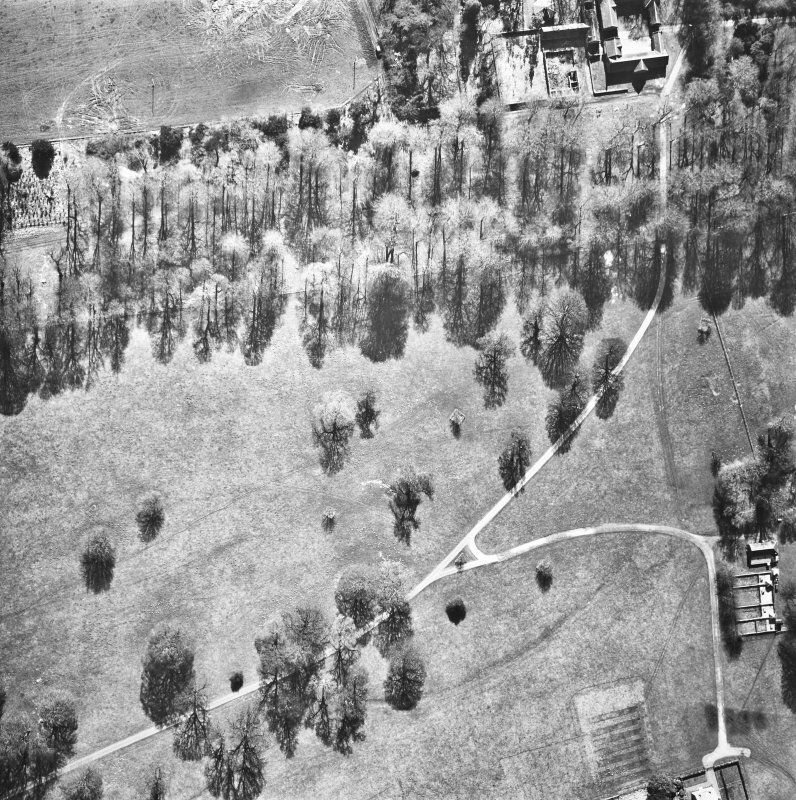 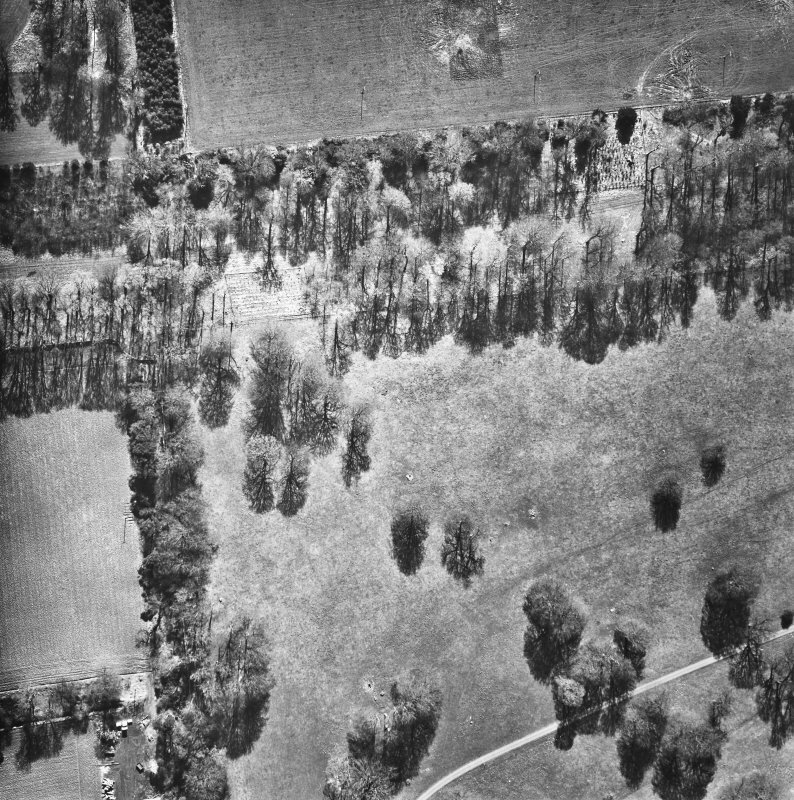 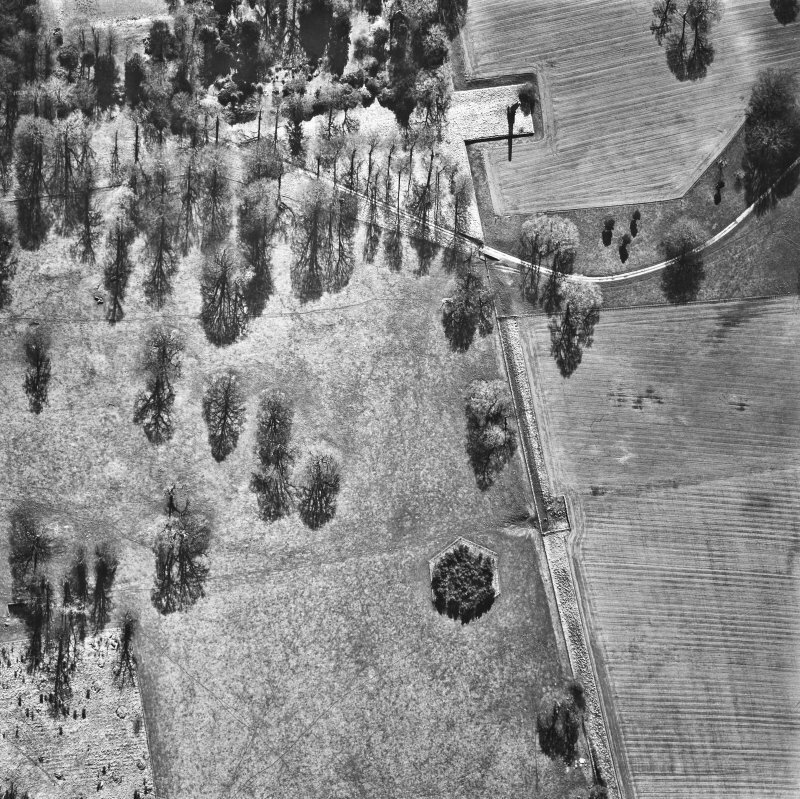 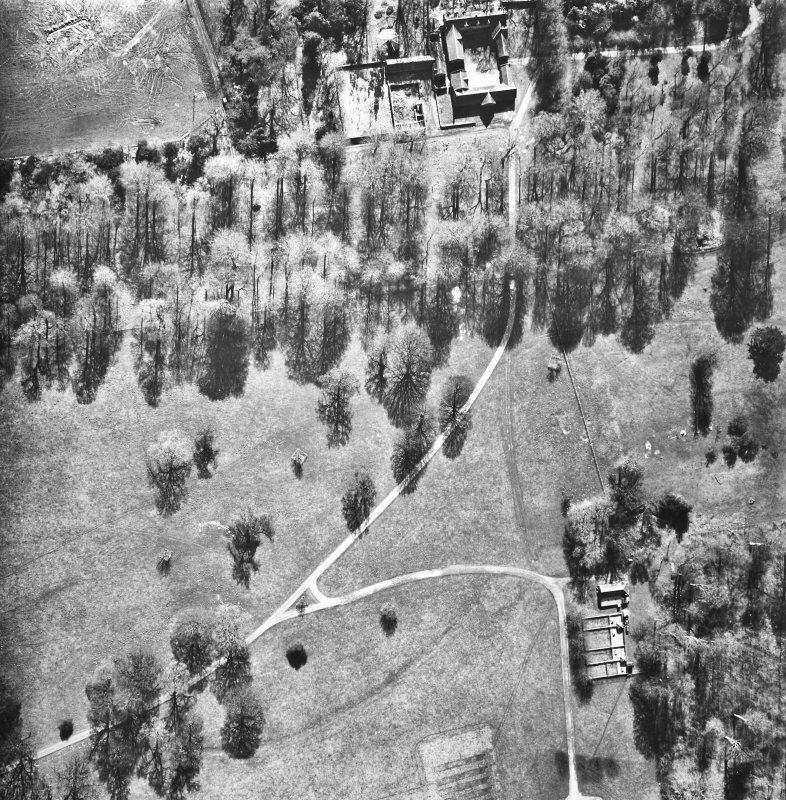 Oblique aerial view of the country house and policies, taken from the W.
General oblique aerial view of the country house and policies, taken from the W.
Aerial view of Tyninghame House, the site of Tyninghame manse, the sundial and gardens and the clock tower court, taken from the N.
For Old Manse of Tyninghame (NT 6182 7981), see NT67NW 2. 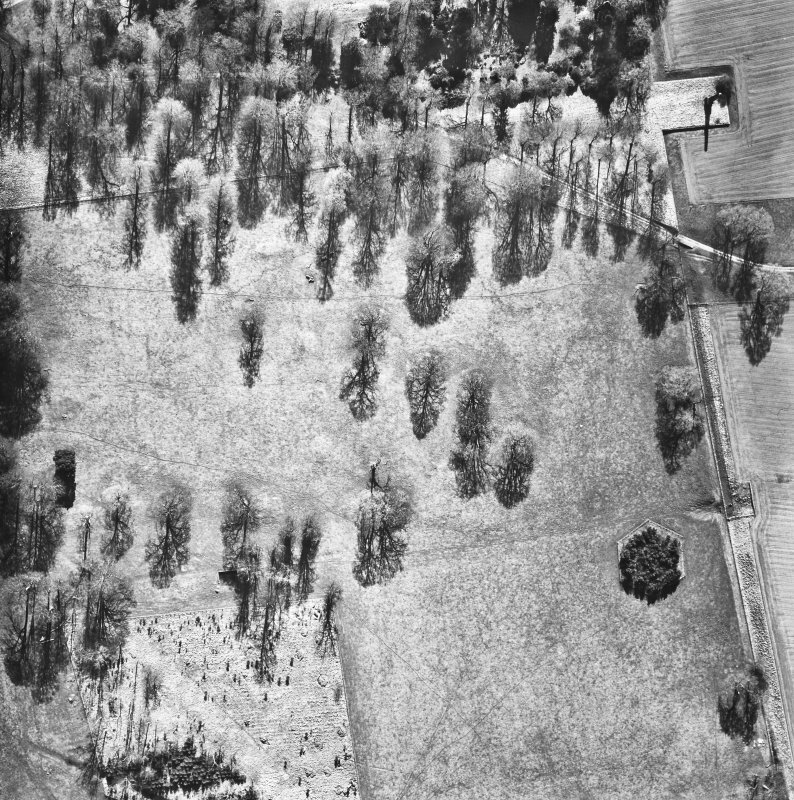 For remains of St Baldred's Church within the policies (at NT 6197 7970), see NT67NW 13.00. 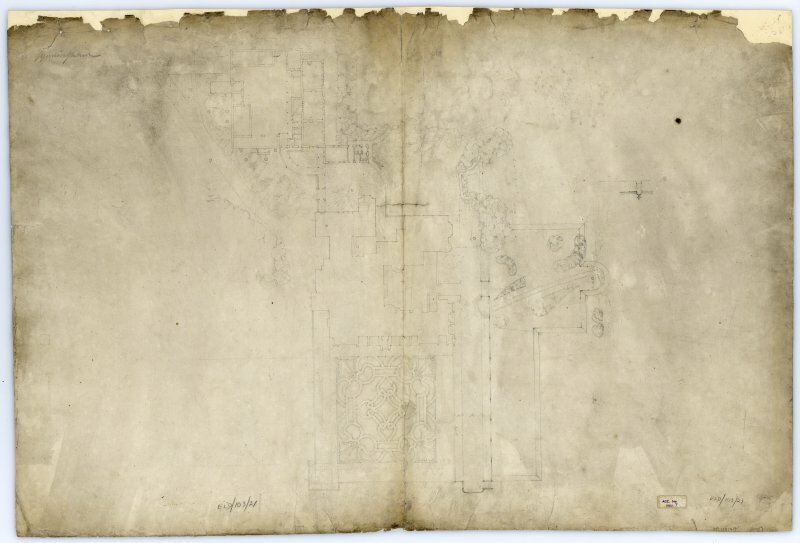 For cross-fragment housed in the stables, see NT67NW 13.01. 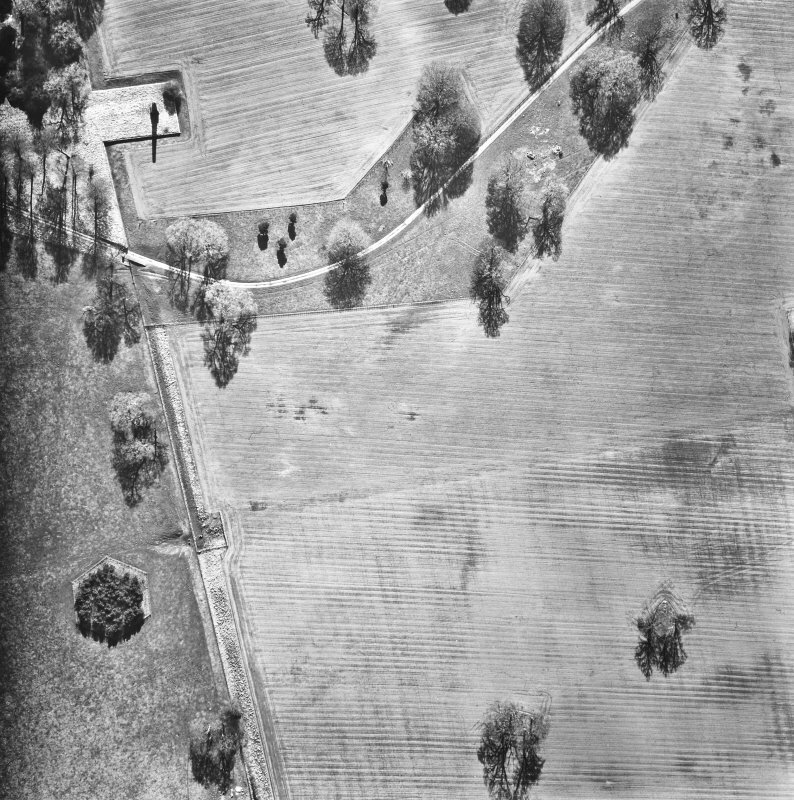 NMRS (Sch. 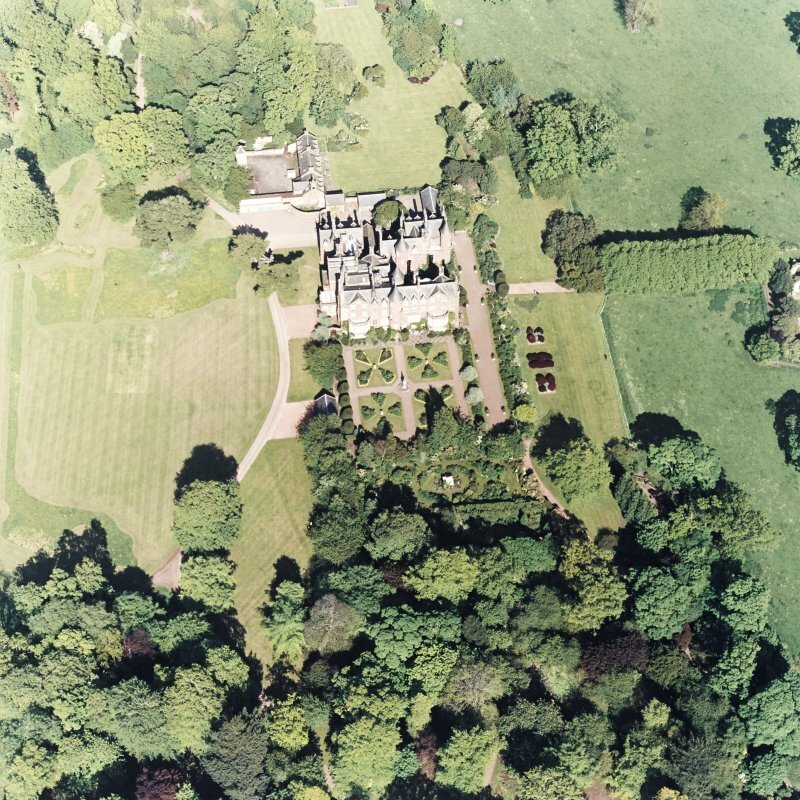 Scott Plans) New entrance porch and wrought iron railings. 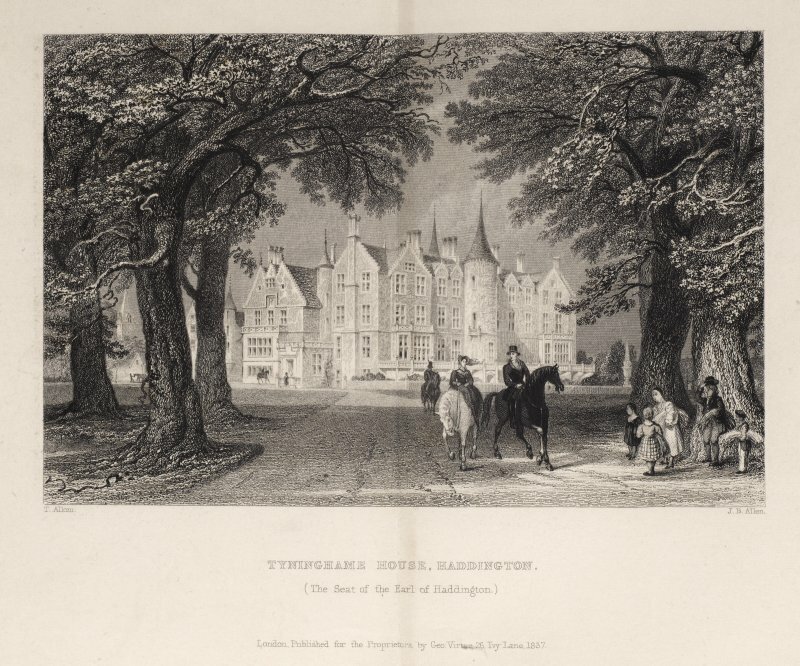 'I should be extremely glad to be with you at Tynninghame to see the great alteration ther is on that place'. 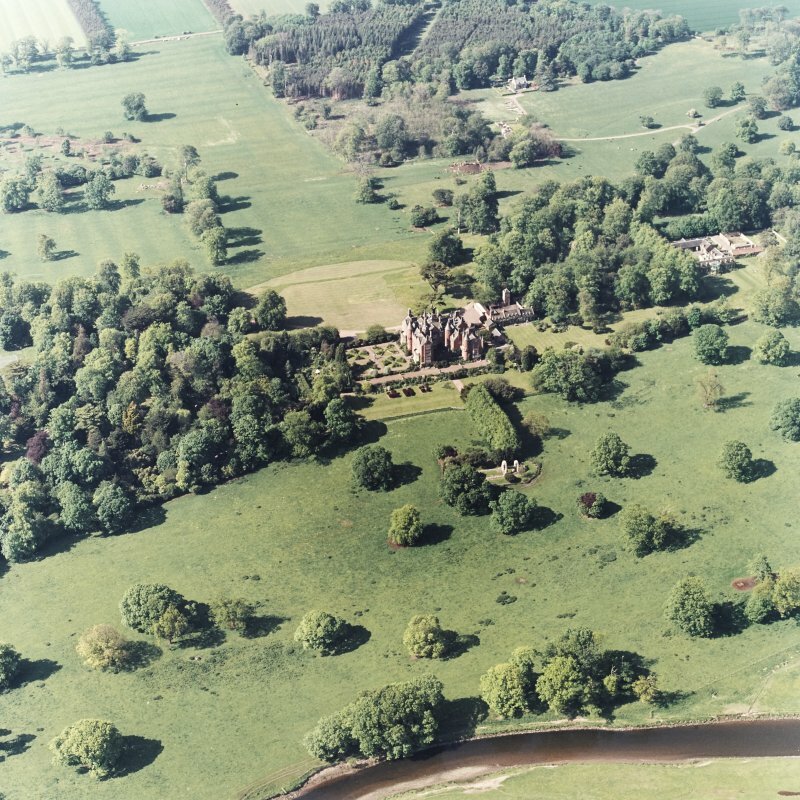 Letter from Lord Polworth (later Earl of Marchmont) to the Earl of Haddington. 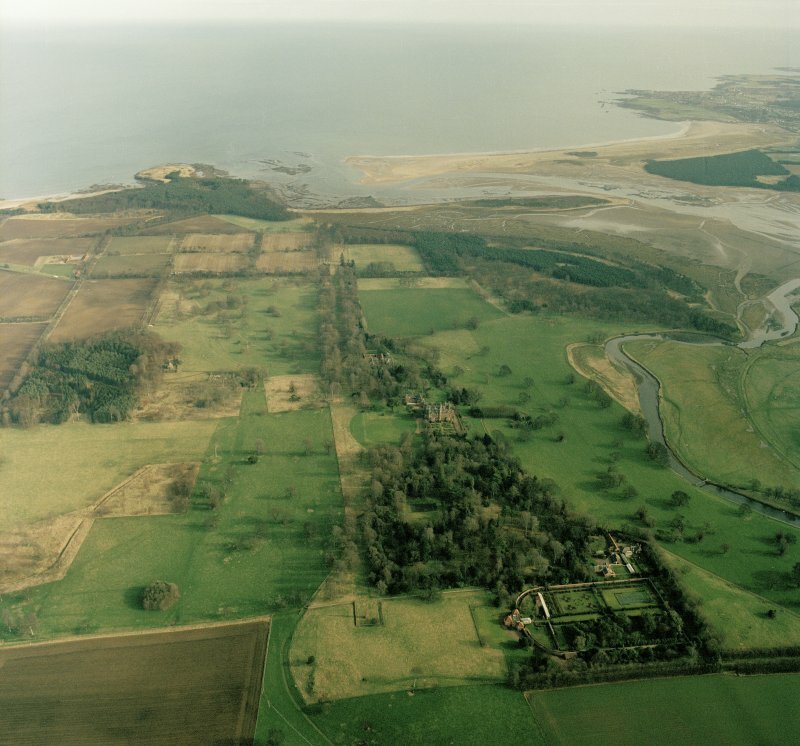 (NT 61934 79840) Tyninghame House: There was a house on the lands of Tyninghame in 1094; additions were made to it in 1617. 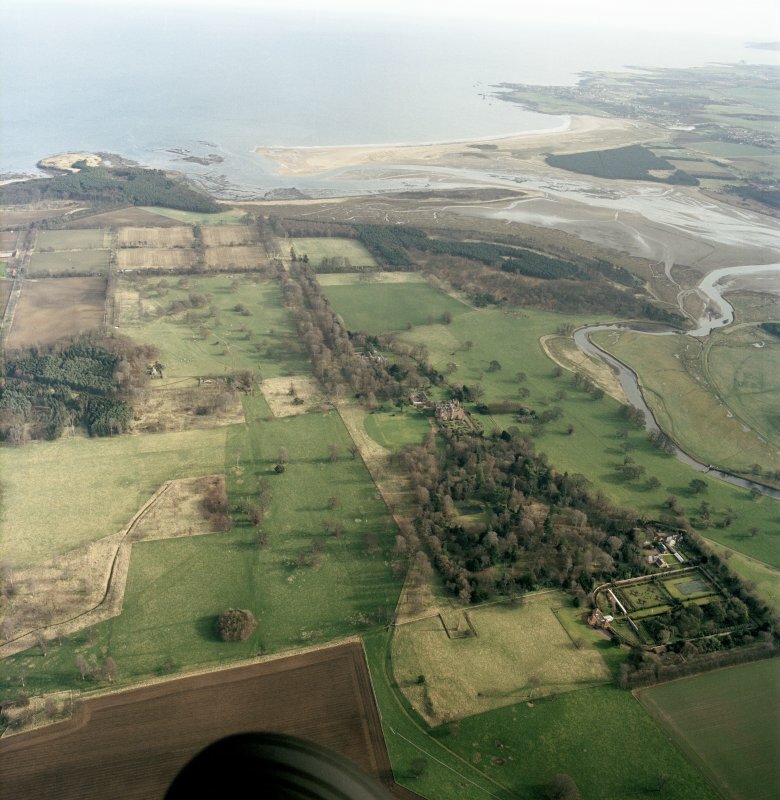 It was used as a country residence of the bishops of St Andrews as early as the 13th century (T Hannan 1928). 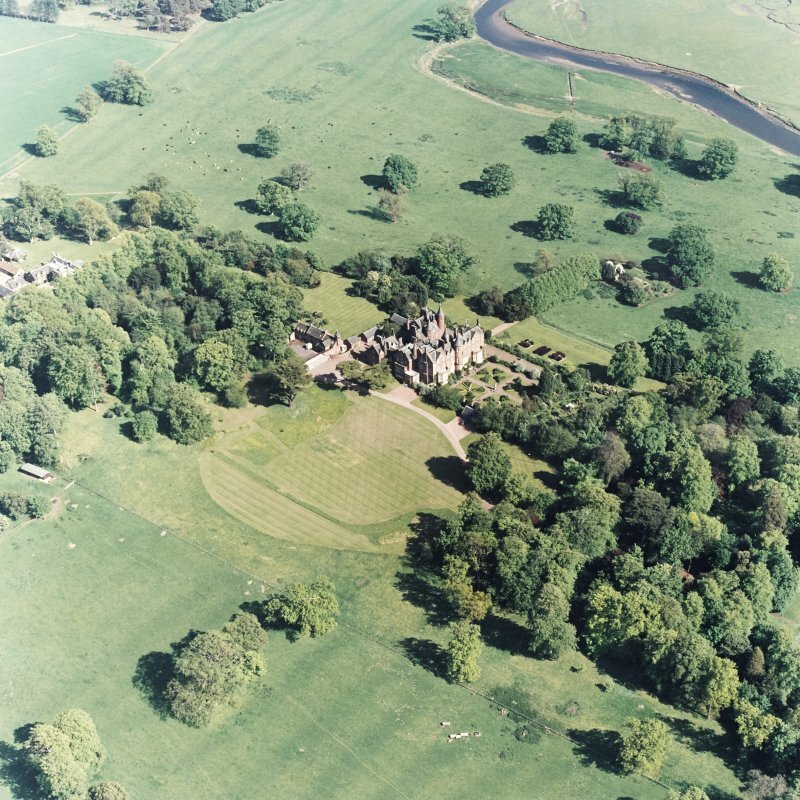 In 1628, it was purchased by Thomas, first Earl of Haddington and since then it has been the principal residence of the family. 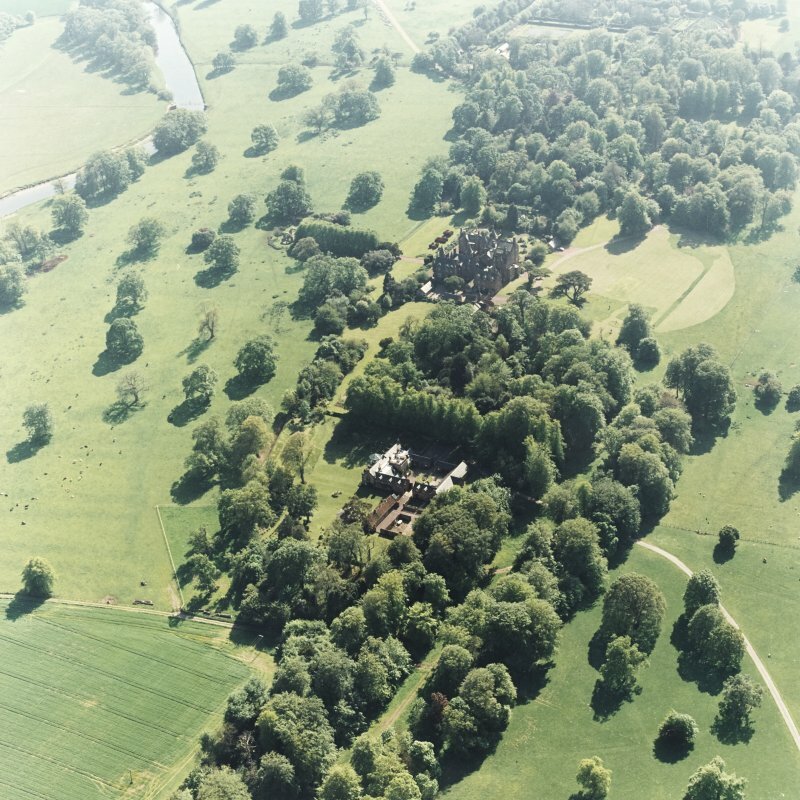 The house was extensively altered in 1829. 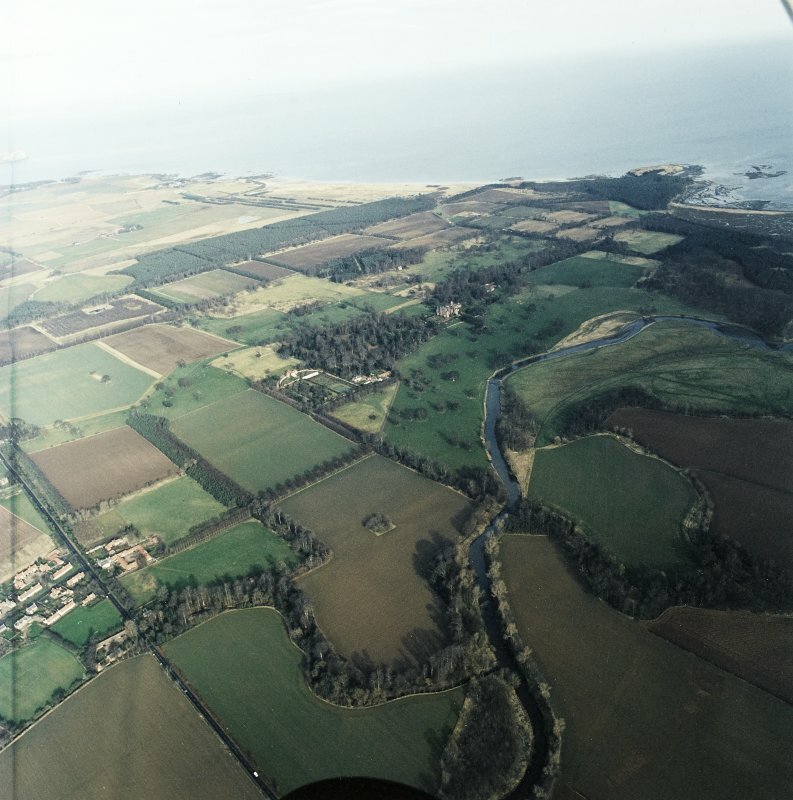 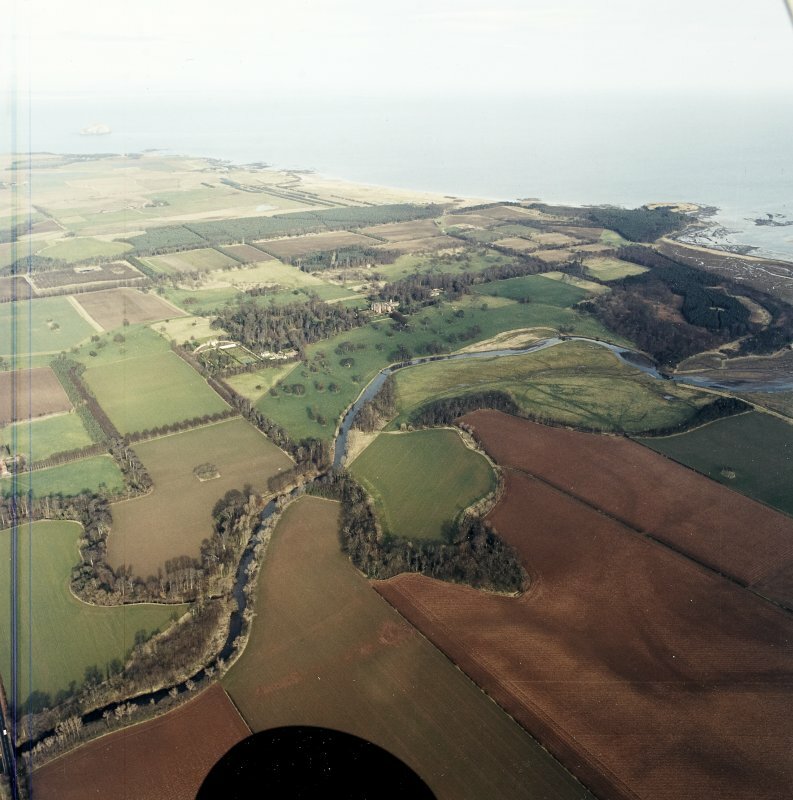 Tyninghame is named in King Duncan's charter to the monks of St Cuthberts in 1094. 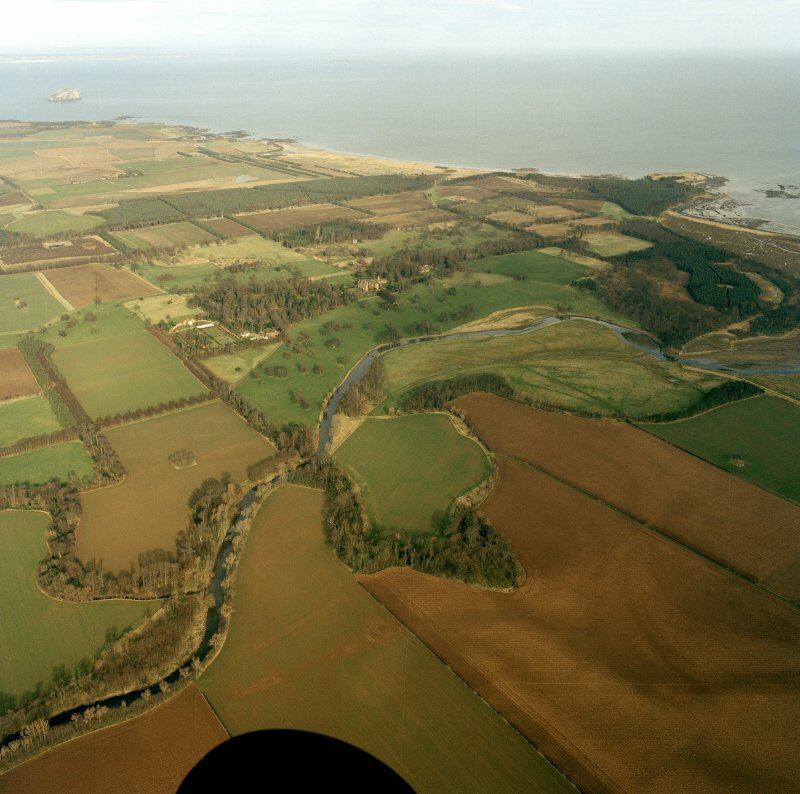 By 1250 Tyninghame and lands had become the proeprty of the bishops of St Andrews, continuing so for the following three centuries. 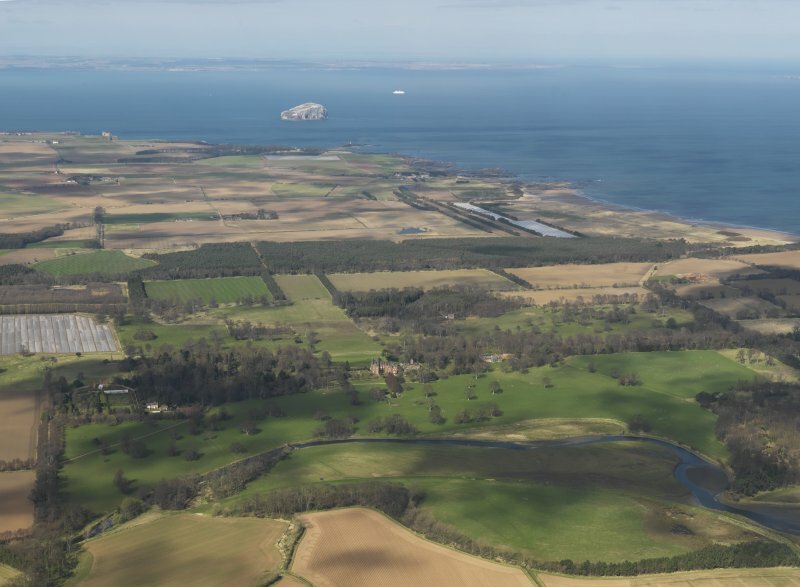 All through the 16th century, it was leased to the Lauders of the Bass, who lived on the Bass Rock in summer and here in winter. 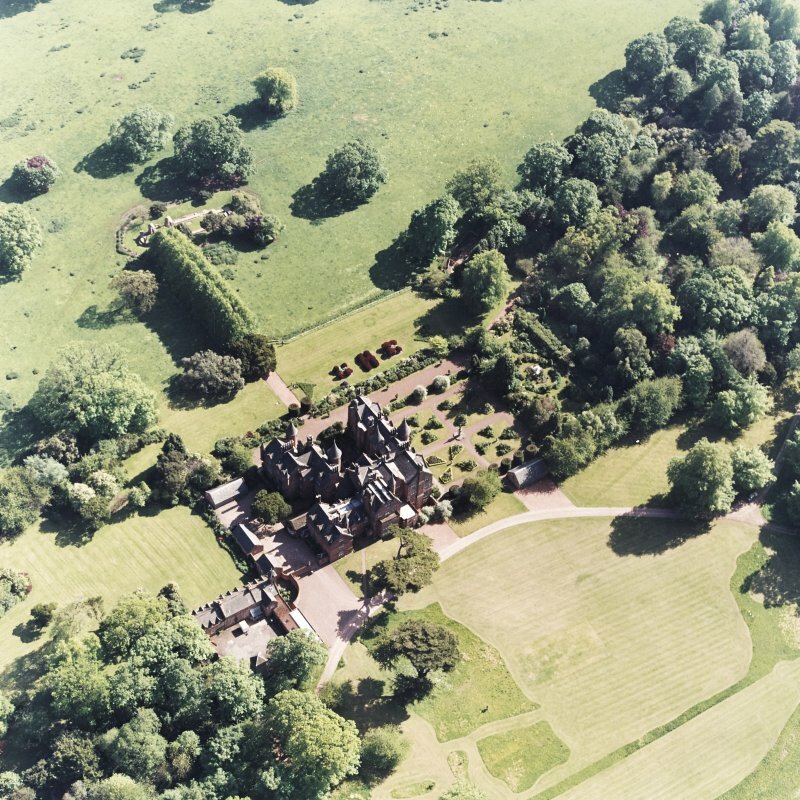 In 1828, William Burn was commissioned by the 9th Earl of Haddington to make extensive alterations to the house by facing with red sandstone and adding turrets and spires. 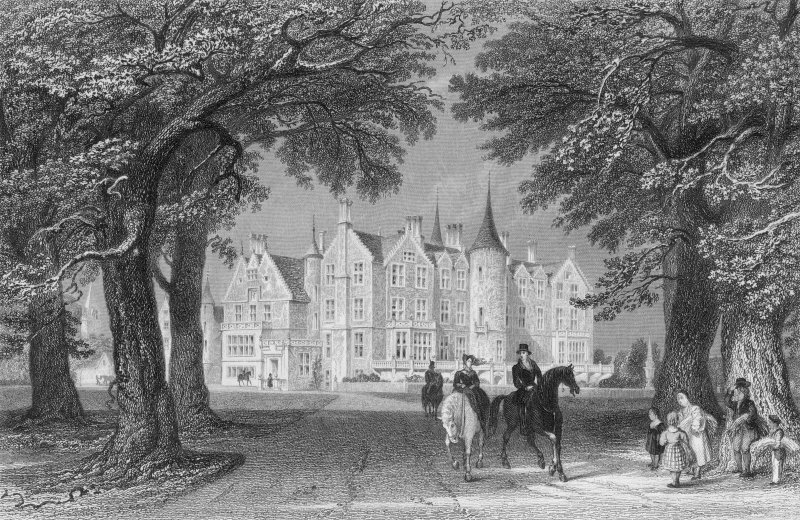 Extract from Estate Records, Haddington Estate Office, Tyninghame. 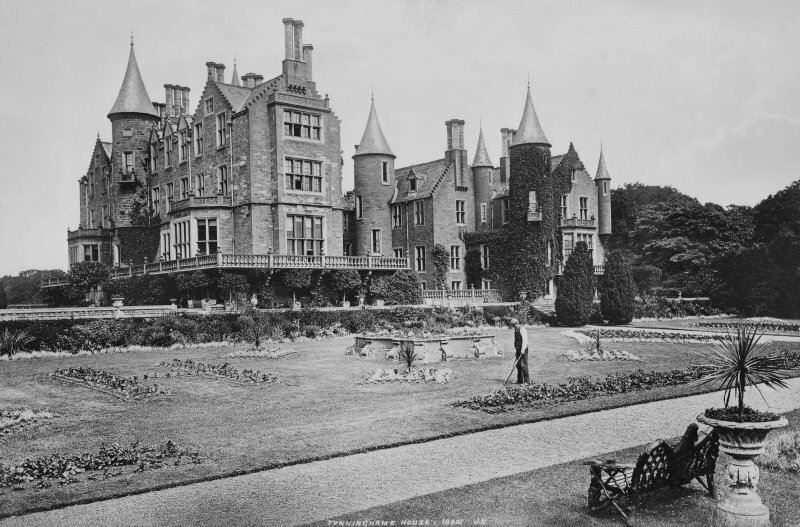 Tyninghame House is a modern three storeyed mansion of red sandstone with turrets and spires. 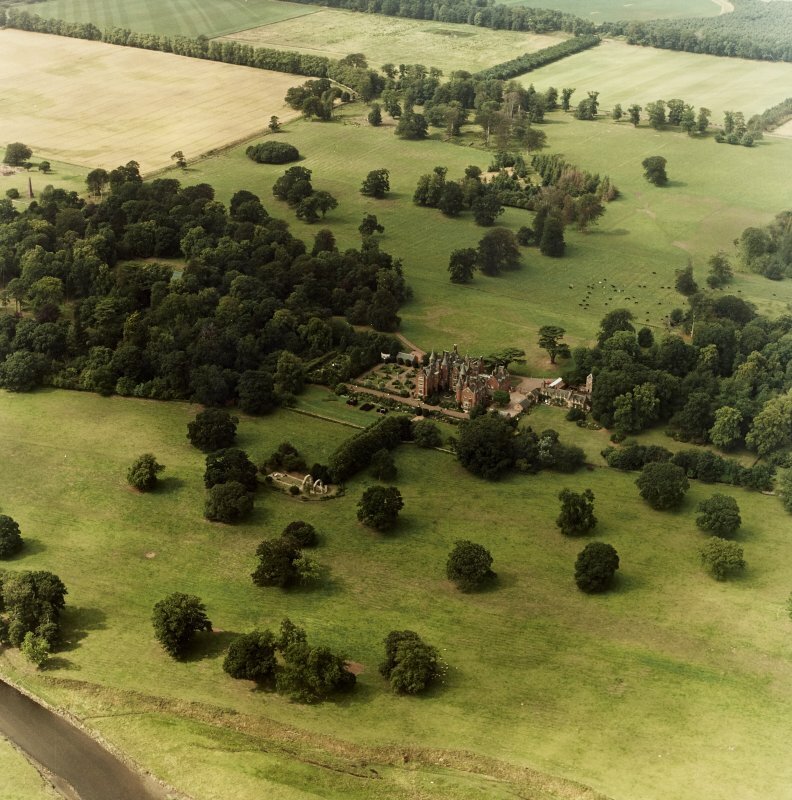 It is the residence of the Earl of Haddington. 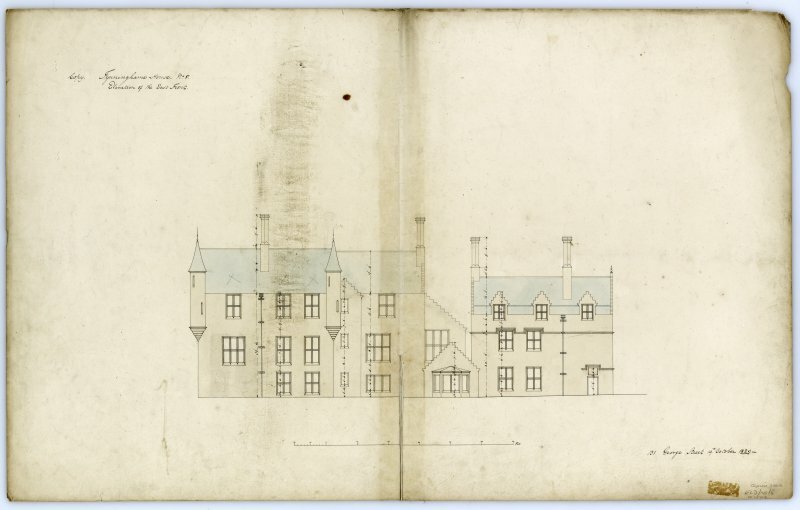 The 17th century character of Tyninghame House as it appeared in the early 19th century is conveyed by a sketch in the library and whose extent is clearly shown in the drawings for Burns's alterations. 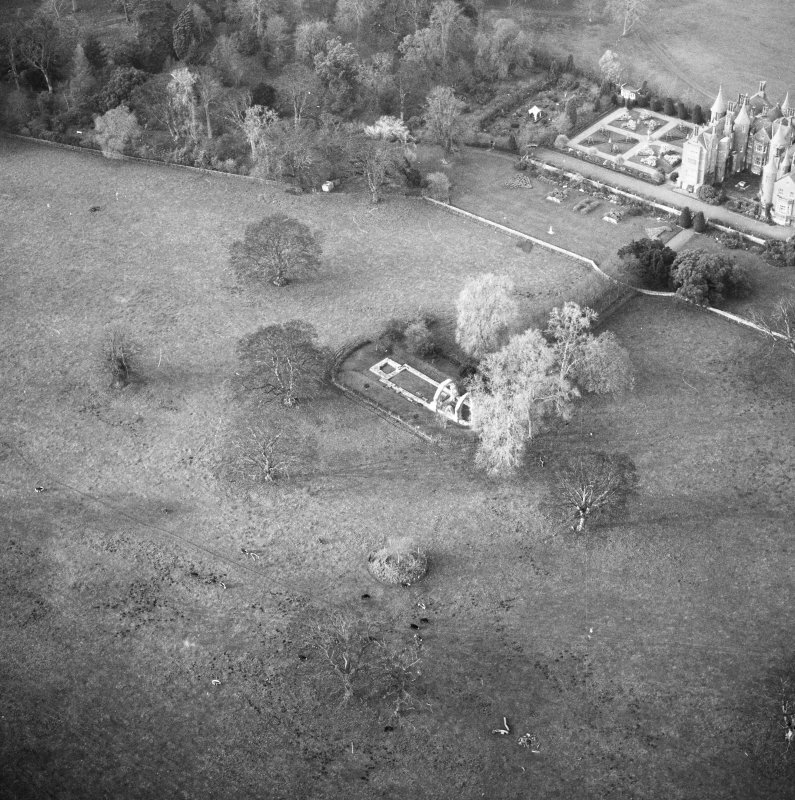 The old house was built round three sides of a courtyard (where some old masonry is still visible) open to what is approximately the S, the oldest part being the thick-walled N and W ranges. 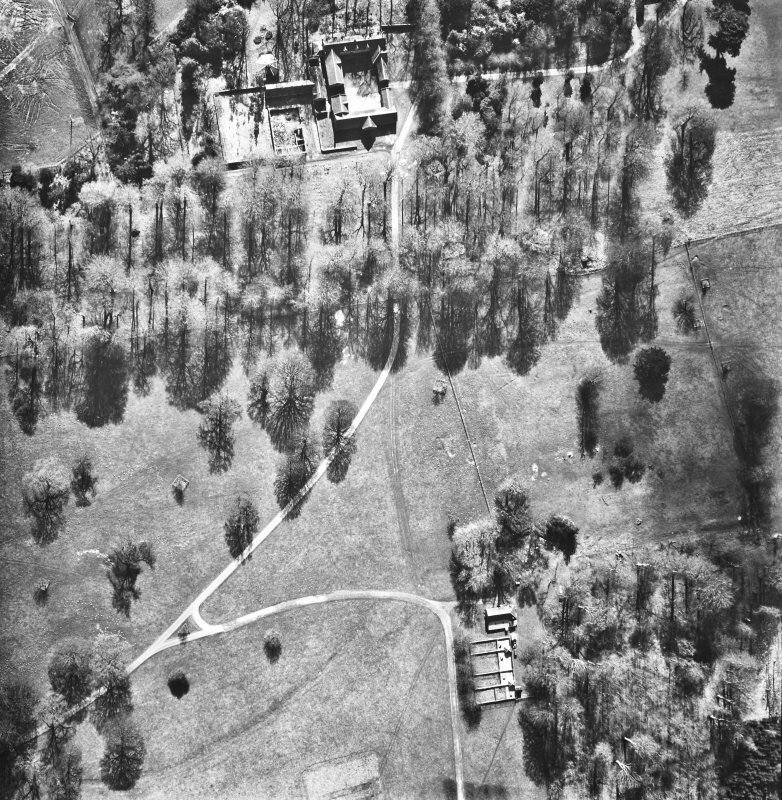 It subsequently rambled out to the SE and expanded to the N. Apart from the bay windows, Burns's only significant additions to this plan were the porch, the lengthened W range and a new corridor alongside the SE projection, where he also put on some new turrets; those of the W range were there already. 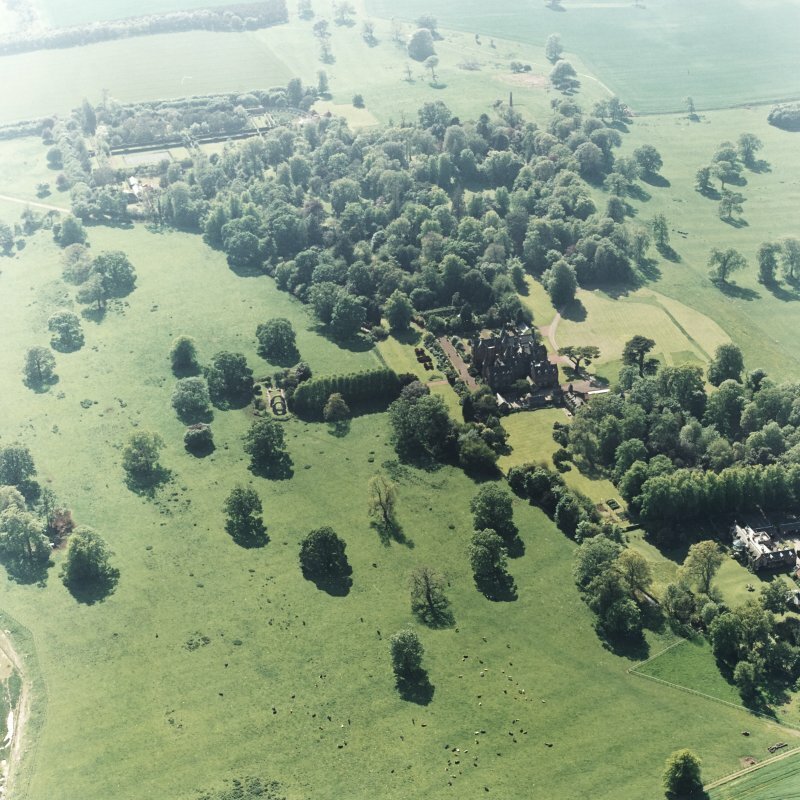 However, the elevations were completely altered; the walls were almost enturely refaced, new windows made and the house given a baronial appearance.